Project 6 began back on 13 May with a fabric review, then came collage, appliqué, 3-D, and always sketching and design development work. As I worked through this project I had some specific goals in addition to the standard course requirements. In feedback on Assignment 2 my tutor Pat commented on my tendency to tight and controlled work, working things out in an academic way, and the need to develop a more fluid approach, going with my intuition and allowing myself to acknowledge my emotive response. So in writing this commentary I’ll be reflecting on that as well as the specific questions in the course notes. 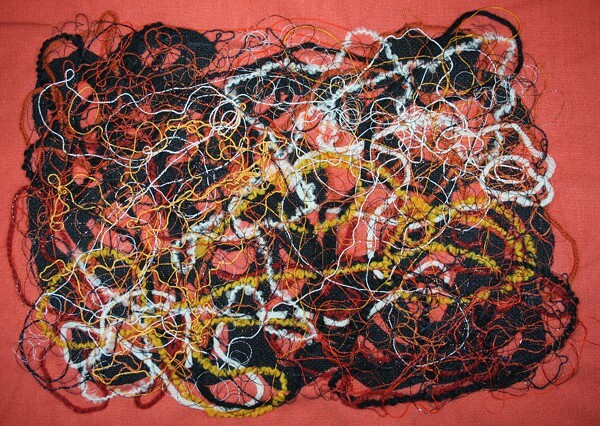 How does working with fabric in this way compare with working directly with stitch? I find working with fabric more direct. I can hold it in my hands, feel its properties, layer and fold and twist it. To me stitch is an addition to fabric, hopefully enhancing it. Fabric is the core. 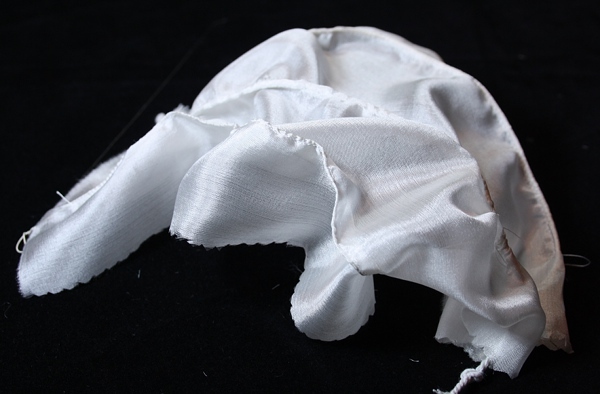 It’s a matter of emphasis – fabric isn’t just the foundation for stitch, it is the foundation. (Having said that, I’m reminded of Maria Laet’s work in the Sydney Biennale. Her photographs show stitching in snow, the sandy shoreline…). I found it easier to work intuitively in the 3-D section. Even though I chose to do a controlled set of comparisons, with each individual fabric I was delighting in its specific response to the transformation. 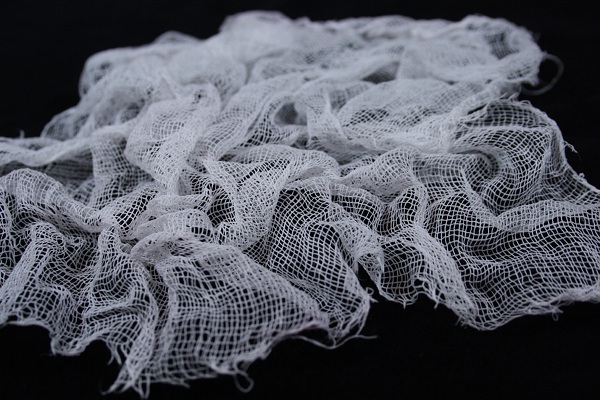 For example I could see the cheesecloth bunching under the pintuck foot, and immediately respond by varying my tension and direction holding the fabric. 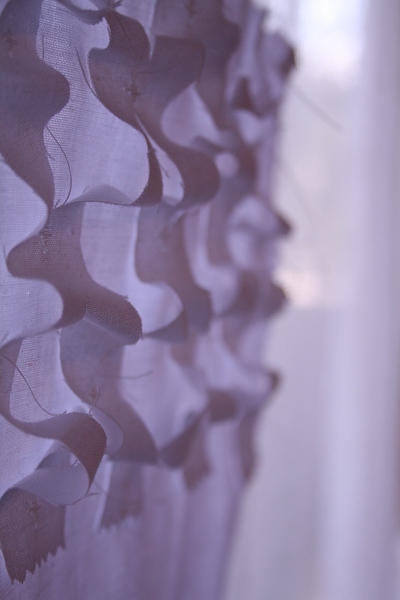 Are you pleased with the shapes and movements that you have created in both appliqué and fabric manipulation? What would you do differently? The appliqué samples are all pretty static and boring, except for the “orange scribble” piece (sample 3). After all the prissy, dinky mini-samples (sample 1) and the very tight portrait in silk (sample 2) it was a relief to relax with a high level idea and responding to what I was seeing. I became very involved and excited with the 3D work. There are some really interesting and lovely results, and heaps of potential. In terms of doing things differently, I’ve tried to note lots of ideas and things to try as I’ve written about each stage. I’ve stayed for a large part of the time with my preferred natural fibres, but I’ve also challenged myself to work with some other fabrics. There are lots of places where I could do more, but I think the approaches I’ve taken have provided good learning, opened my eyes, extended my skills and created a resource to help drive further work. I’m also becoming aware of personal preferences and attitudes which could be the kernel of my own unique voice and style. So I want to challenge and push, but also nurture what is natural and meaningful to me. How did the pieces work in relation to your drawings? Were the final results very different from the drawings? Did the fabric manipulation technique take over and dictate the final result? 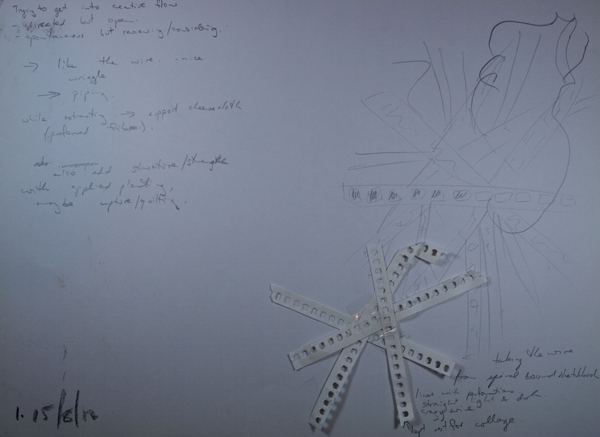 Both the appliqué and the manipulation final samples remained close to the drawings. In the appliqué I wish it had remained closer, because a couple of nice curves from element to element were lost (eg on the right hand side, two reflections leading up to the stalk dimple (is there a proper word for that? navel?) of the top right fruit). With both of them I did a series of drawings just before starting work, additional to the original drawings. Then I basically put the drawings to one side while working with the fabric. This meant detail adapted and changed as work progressed, but the overall result clearly relates to the source material. 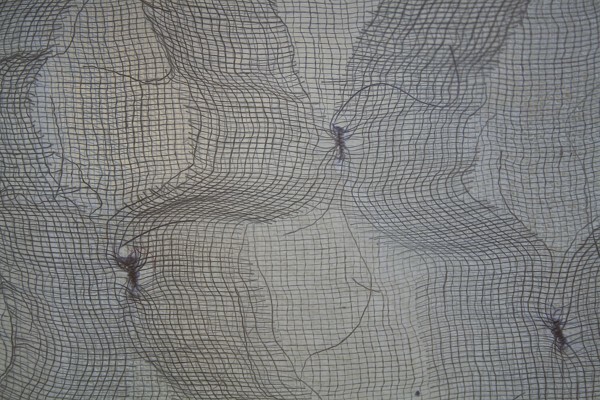 In the 3D sample my drawings were based on three zones of different textures. I actively used my previous samples to select a fabric and techniques to use. 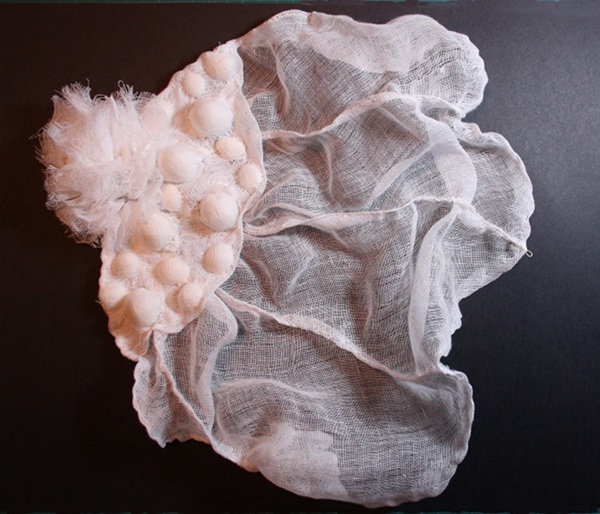 When I introduced the silk cocoons to support the fabric puffs, then still more cocoon for lower relief texture, it was part of a flow, a back and forward between my ideas about the drawings and the shapes and possibilities I saw forming in my hands. I’m looking forward to Pat’s feedback, because I really feel I’ve made steps in the direction she suggested and I’d like some external perspective on it – whether I’m right, what and how to push further. Was it helpful to work from the drawings in the appliqué exercise? Would you have preferred to play directly with cut shapes and materials? My work shows three different approaches. Sample 2, the military photo, was basically a totally mechanical exercise of reproduction. I achieved my objective but for me see no future in such a rigid approach. 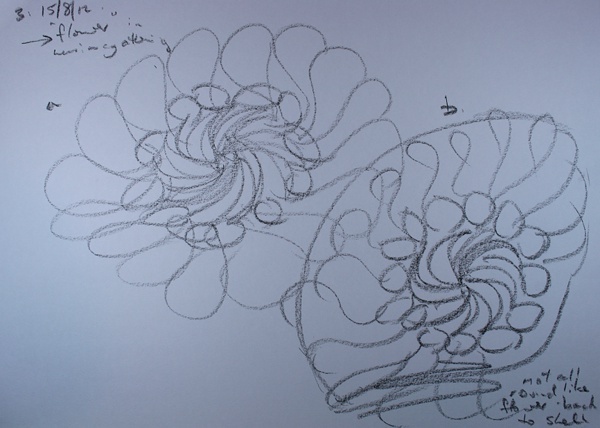 Sample 3, the orange scribble, is in the spirit of the original drawing rather than directly working from it. I keep saying it’s a bit of a mess but I liked having that sense of a general direction, a reason or guide in making decisions as the work progressed. 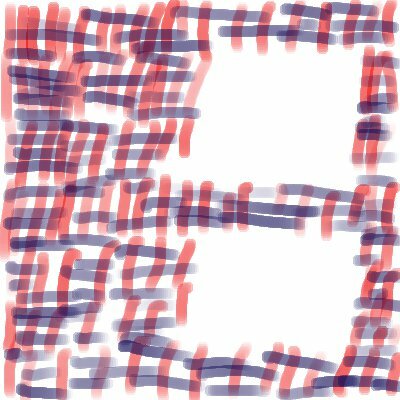 Without drawings or some kind of plan, I generally feel I am just tinkering around until/unless an idea comes along to give at least a short term guidance to the experimentation. My final sample, the fruit, is somewhere between those two extremes. I don’t think I could have got the result I wanted without doing the drawing work first (well to be honest I didn’t really get the result I wanted, but I think I got close). Since I’m trying to develop the spontaneous, intuitive side it would probably make more sense to play directly with cut shapes and materials. 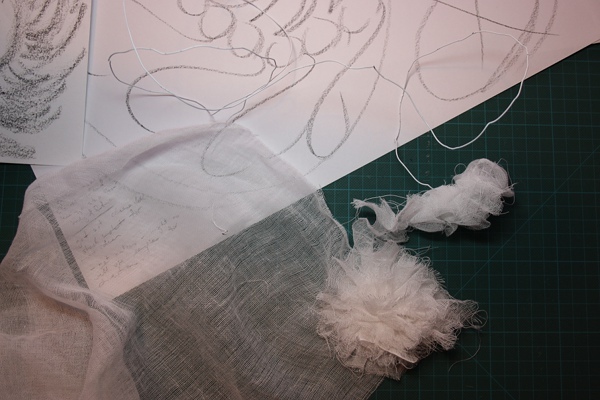 At the moment I like the idea of play and experimentation both in the sketchbook and direct with fabric, as a foundation to work and a way to discover new possibilities, combined with working purposefully and flexibly based on drawings and prior experimentation. Perhaps one constantly moves through different modes of work, especially on a large piece. How do you feel about working with stitch in general? Is it an area you would like to pursue in more depth? Do you find it limiting in any way? I’m a bit perplexed by this question. Is “stitch” a typo? At this stage I don’t want to limit myself. Internally I still see myself as a weaver, augmented by stitch, appliqué, print, manipulation… I like the idea of an arsenal of tools, techniques, materials, all available to be used and extended to meet whatever current purpose I have. If I wanted to excel in a particular area I could have tried a master weaver program. I have found satisfaction and interest in all the techniques introduced in the course so far. I want to pursue all of them in more depth. None of them stand alone. For the final sample the course notes asked for further development of one of the drawings used in Stage 2 (blogged 15-May-2012 – doesn’t time fly!). I’ve chosen this course, and in general life I’m a rule-follower-type – but I couldn’t do it. I looked at the drawings and didn’t feel interested, let alone excited. Really, while working on all the earlier samples I’ve been thinking of the shell I sketched somewhat obsessively earlier this year. 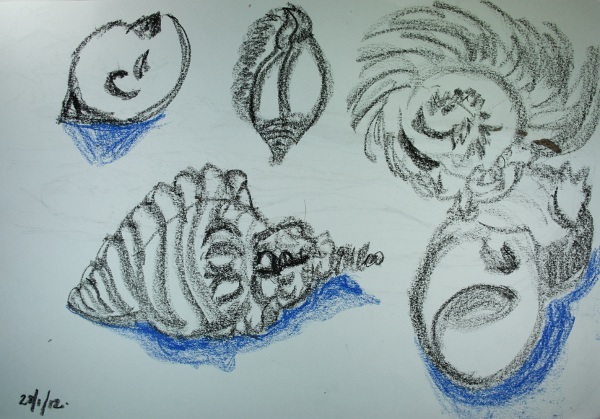 I went through the plastic tub of work (aka my sketchbook), got out a bunch of shell drawings and zeroed in on this one. In particular the lower left and upper right sketches look vigorous and bold and textured and contenders for development. Pulling out a page to start working on development, I got distracted by the wire of the spiral binding… Maybe that could be extracted and used in piping? Some more work with the shapes in the original drawings and I felt I had a good idea to work with. It’s not that they’re anything wonderful, but I want to show the development for course purposes. Next question was fabric. I considered my earlier samples. If you’re another OCA student follow the instructions in your notes (there seem to be quite a few variants anyway as we all start at different times) – it turns out I’m not so much a rule follower but low level subversive. Rather than the suggested crispness of calico I decided cheesecloth was a good fit for the shapes developing on the page and in my head. I wanted to use what I’d learned so far and put a number of individual techniques together. 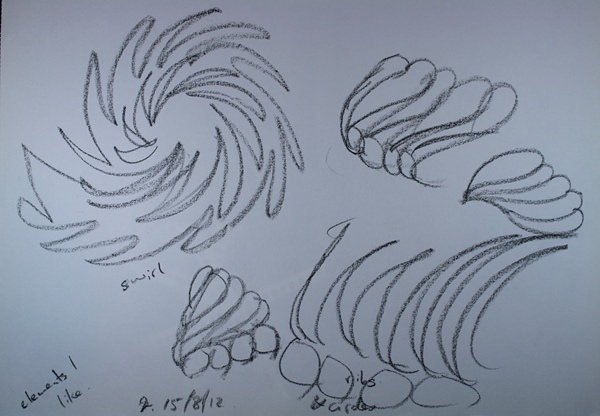 The first element of the drawing that attracted me was jagged swirl. I used an idea direct from Claire in the same section of the course (here) and tore along the edge of the cloth, so the gathered strip is all part of the one piece of fabric. You might be able to see the wire extracted from the binding in the photo too – nice wobbles. The next element was bubbles or puffs. The slashing technique could do that, and by folding the fabric back on itself I could continue with the single piece of cloth. The puffs looked a little flacid and angular. 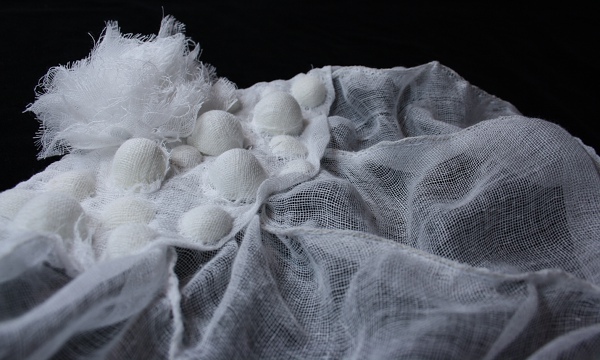 I used some silk cocoons inside to fill them out. 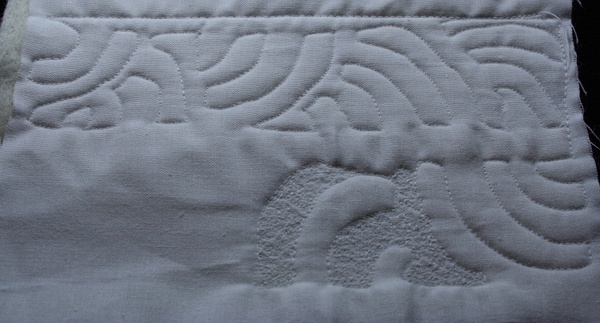 I ended up capturing some smaller pieces of cocoon under the cloth as well, so I did get a quilting sample after all. This part I did by hand – the cocoons didn’t fit under the machine mechanism and it was all a bit difficult to handle. I’m glad I did this, as I was able to get a really nice relief effect. 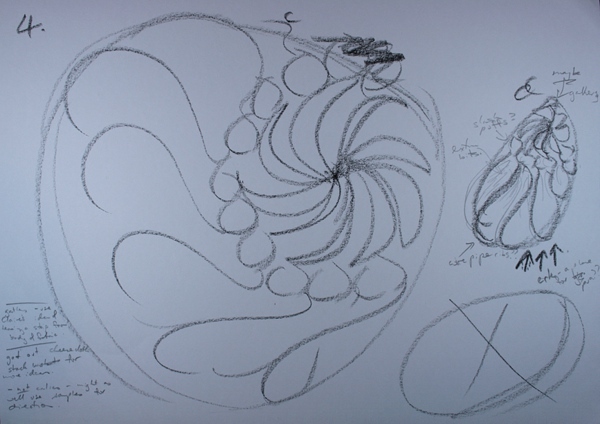 The third element in the development drawings were long sweeping curves a bit like flower petals. I was a bit concerned about the lightness of a single layer of cheesecloth and seriously considered the pva moulding sample (!). In the end I went with piping, although not with the reclaimed folder wire (a bit too heavy). Some overstitching around the edge gently continued the curved movement. 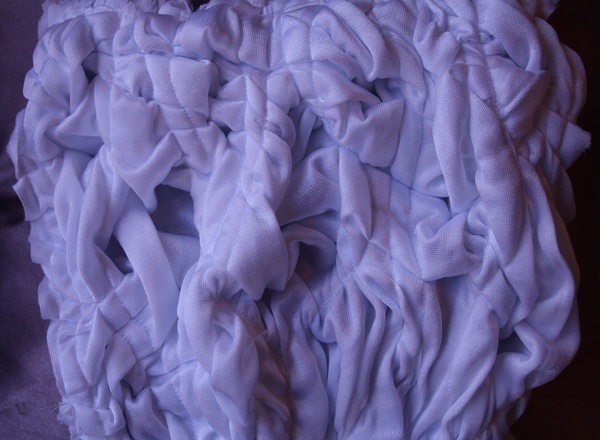 The first attempt of a ruffle (still hanging off the edge of the initial gathering) was too heavy and distracting. The final sample is an oddity, and very difficult to photograph the whole thing at once without the gathered part looking like a single mass. Closeups work a bit better. The gathered end looks too heavy. Simply reorienting it so it hangs down from that end helps marginally. I tried holding it up in front of the window, back lighting being my friend in this project, but no good. The gathering is heavy, distracting and uninteresting. If this wasn’t a sample with a purpose I’d have the scissors out. 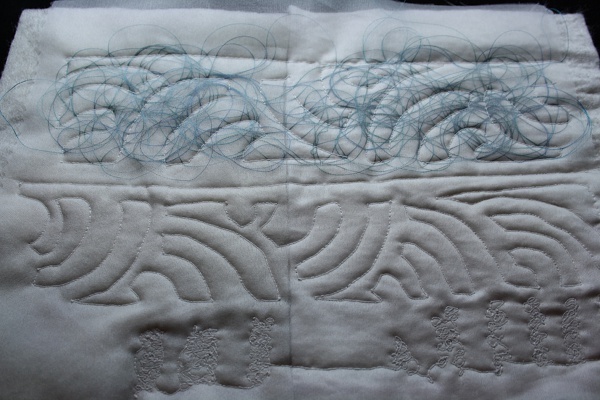 Previous work in this stage looked at gathering, pintucks, piping, slashing, pleating and moulding and quilting. 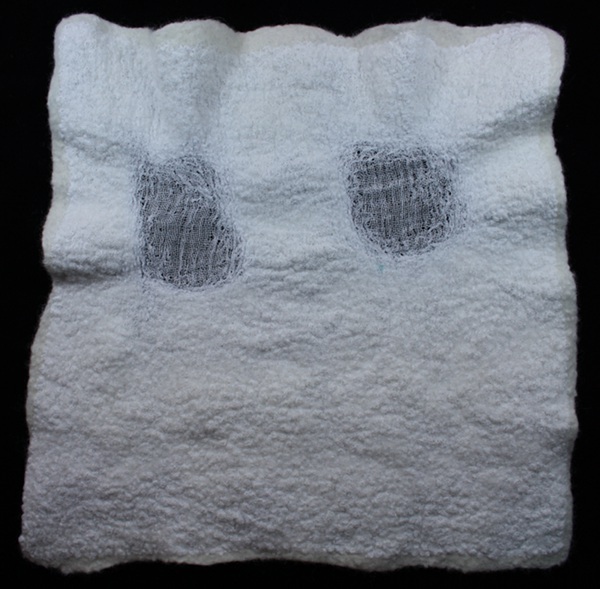 When I first started this project (in stage one, 13-May-2012) I considered the possibility of including some weaving or felting. 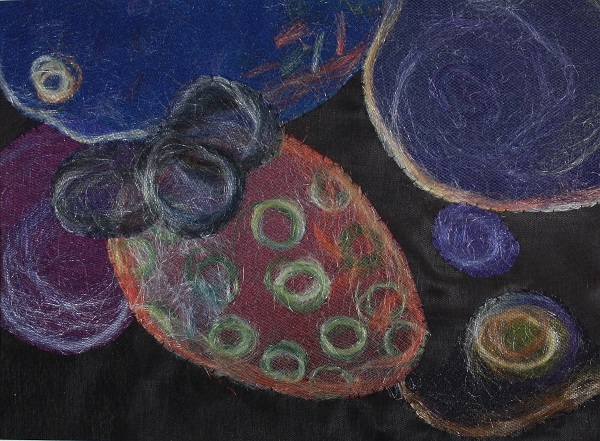 The examples I showed didn’t fit with the study I’ve been doing, but I decided to try felting into my sample set of fabrics. 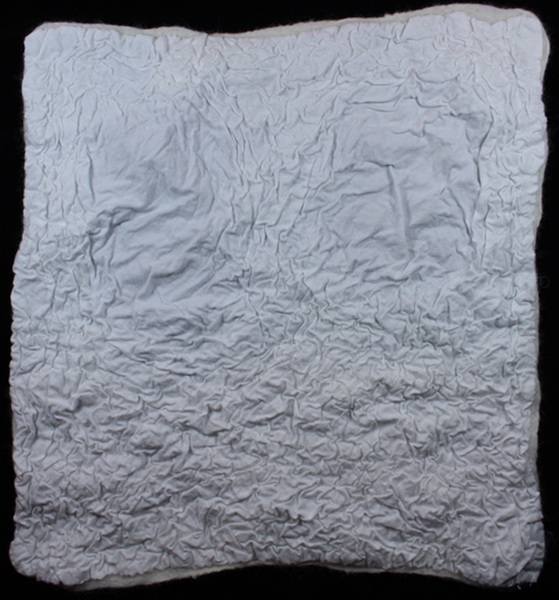 *take a piece of study fabric roughly 42 cm square and lay down on a length of bubblewrap. 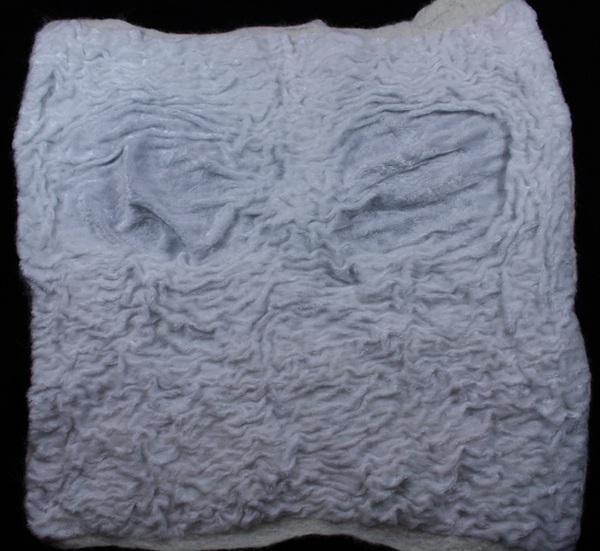 * lay on merino wool fibre, two thin layers with the fibre first horizontal then vertical, with a couple of areas of cloth left uncovered. * wet down with warm water and olive oil soap. * roll up bubblewrap, tie in a bundle then roll back and forward a few hundred times. Periodically untie, check, rotate, repeat. By the end of this the fibretips have wriggled around, some through the fabric, and everything is holding together. * Unwrap everything and full the pieces, shocking the fibres by plunging into cold then hot water, kneading with more soap and throwing the work down hard on the worktop. 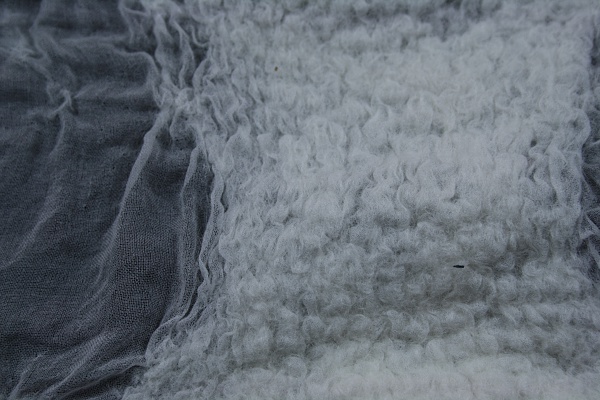 The wool fibres twist tightly around the fabric and each other, compacting densely. 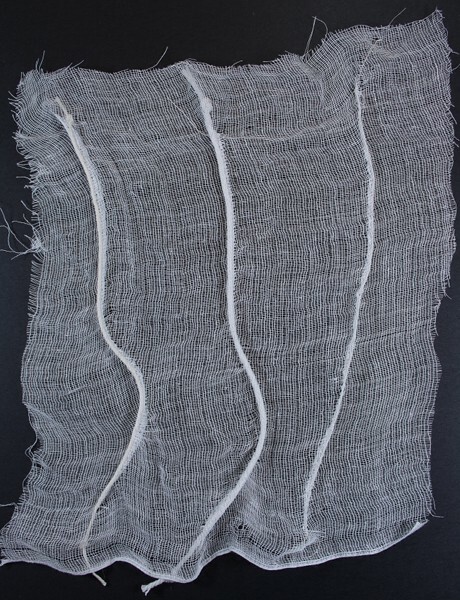 The original fabric is pulled in by the fibres. * Rinse, lay as flat as you can, and leave to dry. There are lots of variations to this process – everyone seems to have their own magic (soap flakes dissolved in water, dishwashing detergent, an electric sander instead of rolling…). 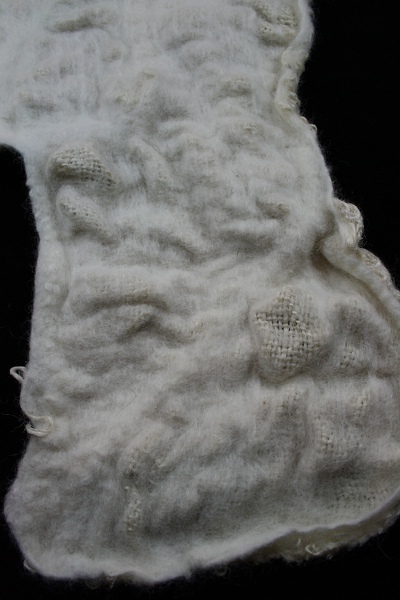 Above is a detail and on the left is the full cheesecloth and wool piece. The final result is around 27 cm square, so the original fabric has shrunk (or actually crinkled) by about 37%. 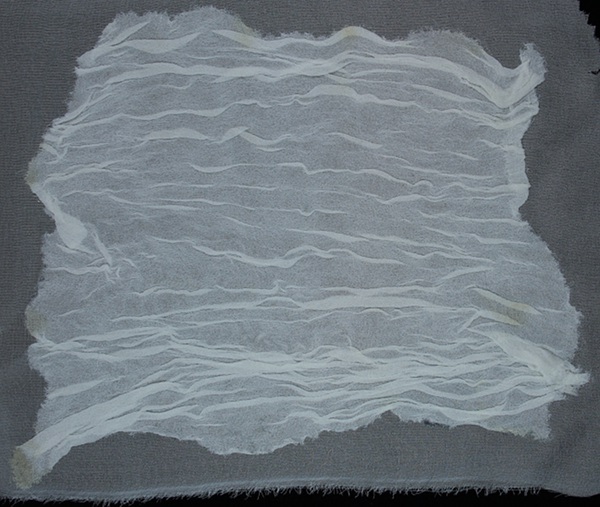 I did the first four samples at the same time – cheesecloth and the three light silks. I was confident these would all felt well, in fact the cheesecloth was the only one I haven’t used in felt before. The results are superficially very similar, although in detail different in sheen/matt and to the touch. Overall the felts would be a bit heavy for a scarf – you’d want to leave more fabric exposed, but certainly light and drapey enough for a vest or light jacket. However for this particular study the most interesting parts are at the boundary of the main felt and the fabric “windows”. The wool to some extent overwhelms my study fabrics. I decided to do second, smaller samples of the light fabrics, this time with a super light layer of merino fibres in one direction only. The goal was to see more clearly the individual character of my study fabrics. 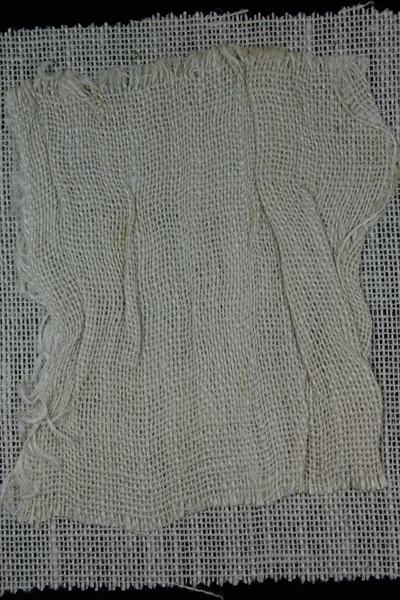 The cheesecloth version is above, only about 13 x 4.5 cm. 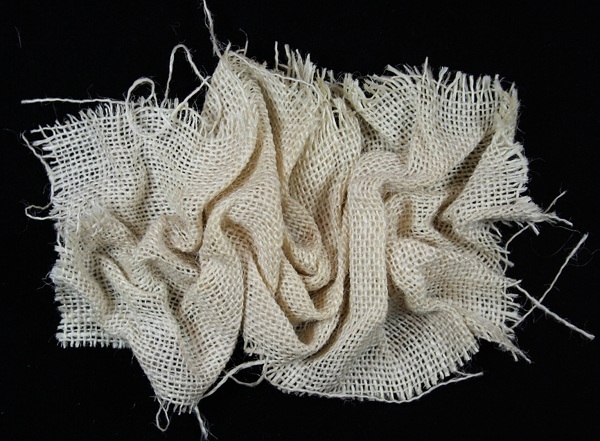 The open weave of the cheesecloth allowed it to collapse very easily into the felt, and the result is very soft, light and airy. The photo isn’t brilliant, but there’s quite a variety of density in the piece, providing visual interest. 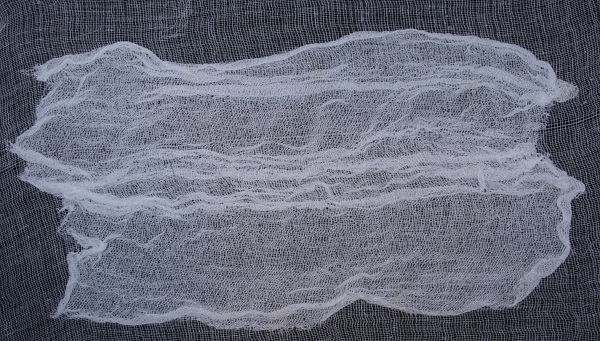 The tissue silk is the smallest final piece, having reduced to about 26 cm square (around 38% shrinkage). It feels slightly rough but soft to the hand and has a matt finish. In the second sample it formed soft, rounded folds. The paj silk has a sheen and glows. It feels soft and smooth to the touch – luscious. 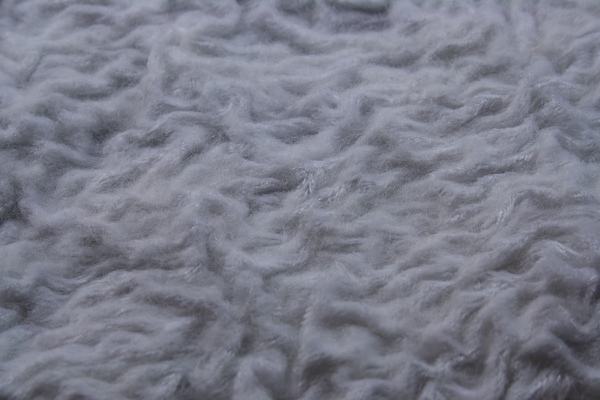 In the small sample it doesn’t melt and conform with the wool as in the previous samples. 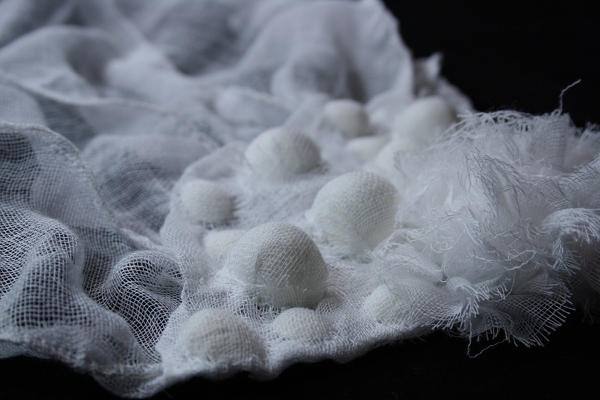 There are almost soft little puffs of fabric gently rising above the surface. 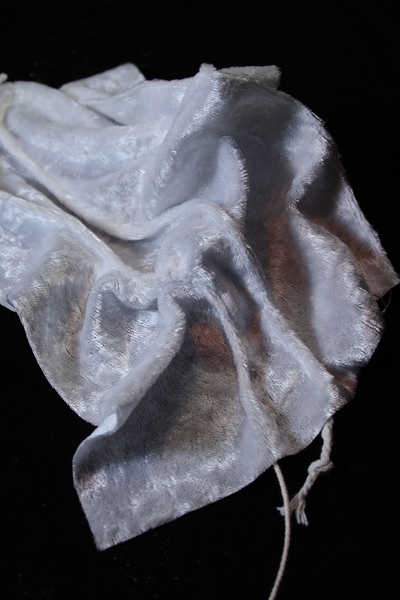 Looking at the sample now, the windows of the exposed silk have a shine but are transparent. It would be great in a reveal/conceal application. Checking back with the other samples they have the same effect but I hadn’t focused on it previously – perhaps the paj shine is reminiscent of glass, calling my attention. 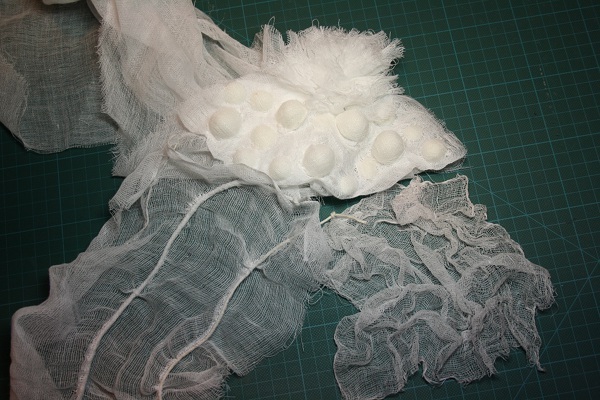 Above and to the left are the silk organza samples. 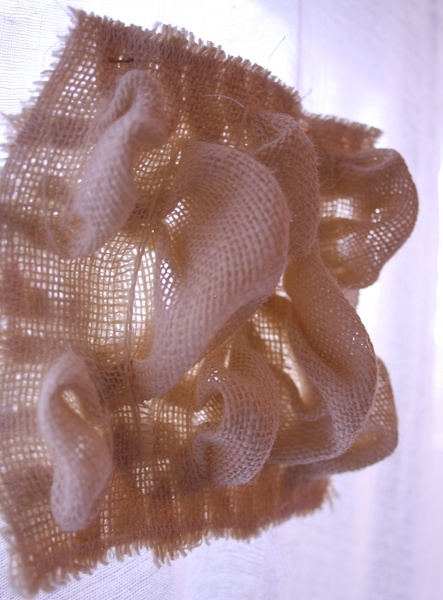 The organza seems to reject the wool, springing away from it. No gentle moulding, it has to be captured by the fibres. 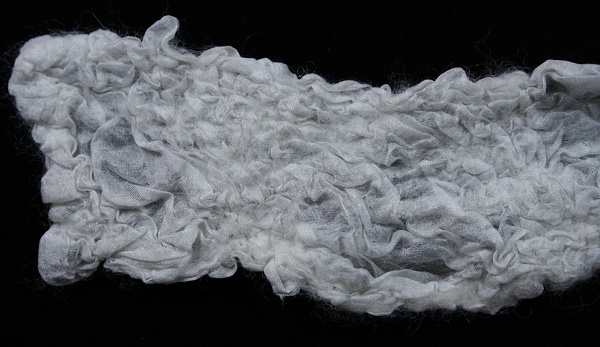 There is a roughness or crispness to the hand, especially in areas with less wool. As with all the samples, I wasn’t concerned about making the felt flat or square – that wasn’t the point of the exercise. All the main samples above look pretty similar, despite my attempts to focus on their different properties. 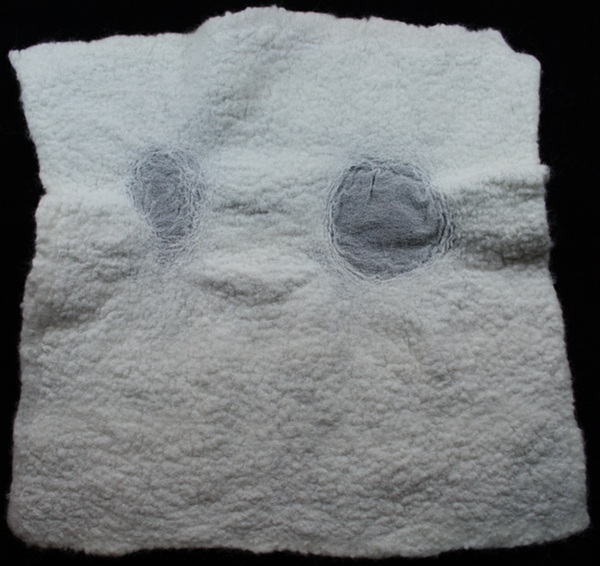 Originally I thought this would be all I had to show of felting. 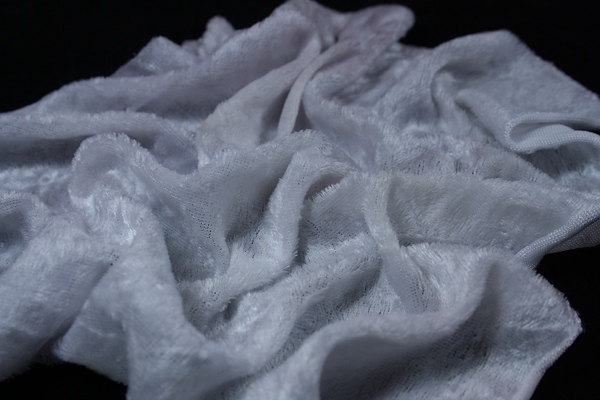 The other three fabrics – cotton, hessian and panne velvet – were poor candidates for nuno felt, being thick and heavy and in one case 100% polyester (even light synthetics being difficult to felt into). Still, I was determined to give it a go despite my expectations, especially since I’d bailed out on the quilting. I took the precaution of pre-soaking the fabrics overnight in soapy water and did quite a bit of extra rolling. I thought it would be an exercise in frustration. I was wrong. Above and to the left is the cotton. 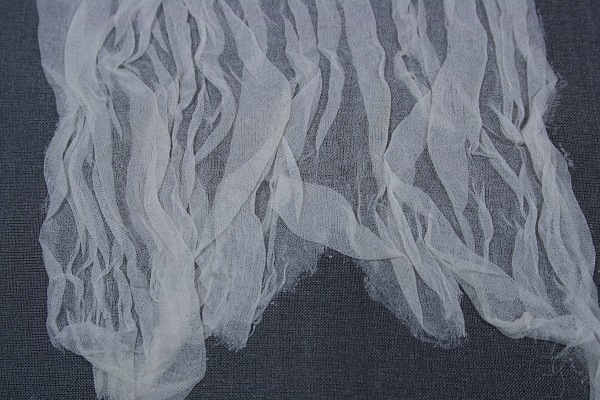 Actually I did think I had a chance with this – a mid-weight fabric, and cotton voile (and cheesecloth!) pose no problems in felting. It has shrunk less than the previous examples, around 26%, but you can really see the shrinkage! The windows aren’t interesting as the fabric is basically opaque, but the result overall is much more in keeping with the purposes of this Stage, in being clearly a 3-D result. As you can see above, this sample also has me holding it up and taking photos in front of the window again. Very nice patterning. There’s a bit of banding, which I expect is related to the way I lay down the fibres and the amount of overlap. If I wanted to go further with this I would card the fibres first (I have a drum carder), rather than just pulling the fibres directly from the purchased top. The hessian sample is a funny little thing. I’ve run out of white hessian and no more in the stores I’ve tried (including two big chains), so just placed a few pieces near each other, layered on the wool fibre and hoped for the best. Quite frankly I am amazed at these results – yet another reminder of the dangers of assumptions. 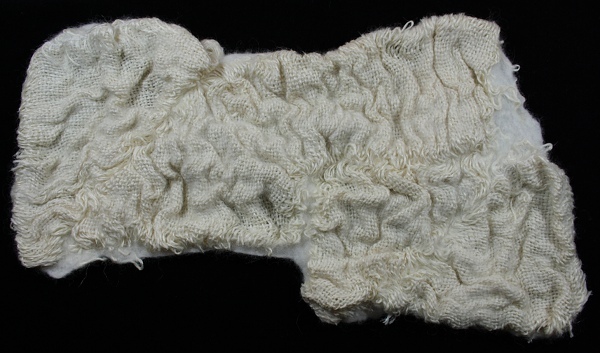 The wool is well adhered to the hessian, in fact the sample is surprisingly soft to the touch due to the wool fibres coming through the fabric. The back view on the left above is interesting too, with little mountains of hessian protruding through the mists of the merino. Of course I had to try the back-lit-at-the-window view. I like it a lot. The front, the back, the back-lit, the hand, the edges of the various pieces of hessian – I like it all and I want to use it in something. I actually think it would be not unpleasant to stitch into by hand. It would provide an interesting base to work with a variety of weights of thread. I’m going to have to watch out for an appropriate opportunity. Finally we come to the panne velvet. The windows of exposed fabric definitely didn’t work. 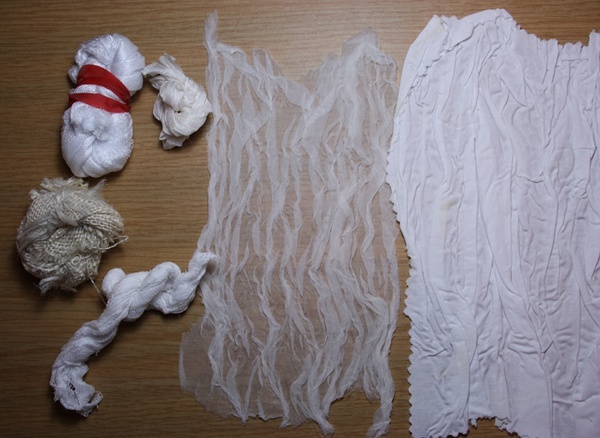 In the photo on the left the sample looks like some kind of woman’s undergarment with unpleasant sagging elastic. So focus back on the photo above. 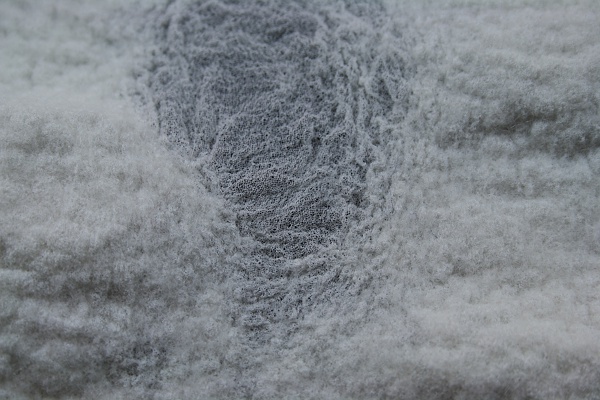 At least in large scale you can actually see the wool fibres coming through the velvet – I was careful to lay the fabric face down and layer the wool on the back. The wool softens the shine of the velvet. There’s still light and life and movement, but not so aggressive. The back view is quite pleasant too. Dimpled, and most just the wool apparent. Quite different to the lumpy mess at the bottom of the post on slashing (5-Aug-2012). I wouldn’t want to make it the centrepiece, but it wouldn’t be a negative. The back-lit view looks good as well. 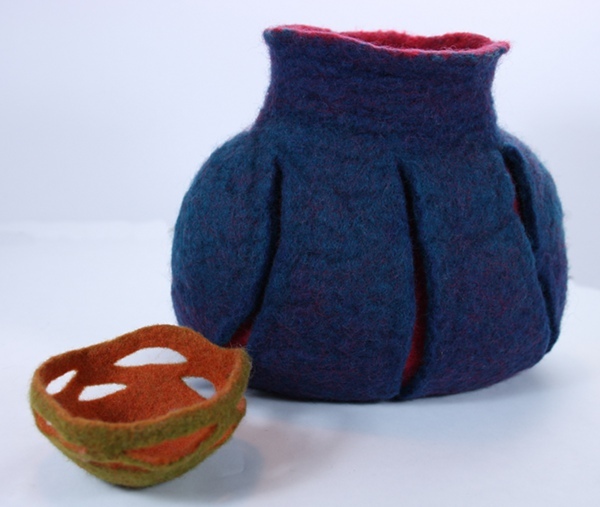 I find myself thinking about the possibilities of colour – the wool fibres and the panne velvet. It’s probably too heavy to throw shadows, but maybe a lamp-shade-like application would work. One would have to think about the impact and dangers of heat, but possibly wool at least has a reasonable rating on that. This brings the experimentation section of this Stage to an end. With each technique I’ve noted more avenues of exploration, but it’s time to move on. Next is the final sample, so I’m going to pull out lots of sketchbook work, pile up all my samples from this stage, and ponder possibilities. I’ve shown gathering, pintucks, piping, slashing and pleating. 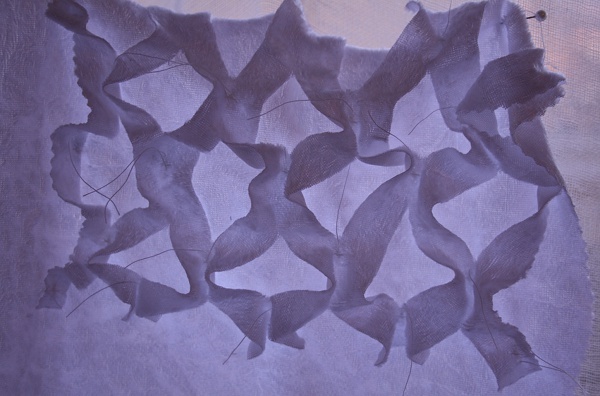 Now it’s onward but not upward – in a perfect world I would redo the samples for moulding and quilting. It’s not a perfect world and I’m not a perfect student, so I’ll share my woes with the blogosphere and move on. “Moulding” is a misnomer in my samples. 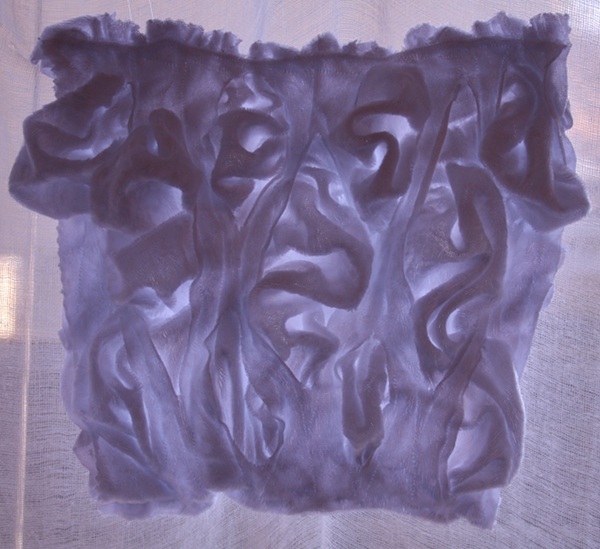 I’ve used the idea of using dilute PVA to hold fabric shape, but created that shape in the material with my fingers rather than using anything as a mould. 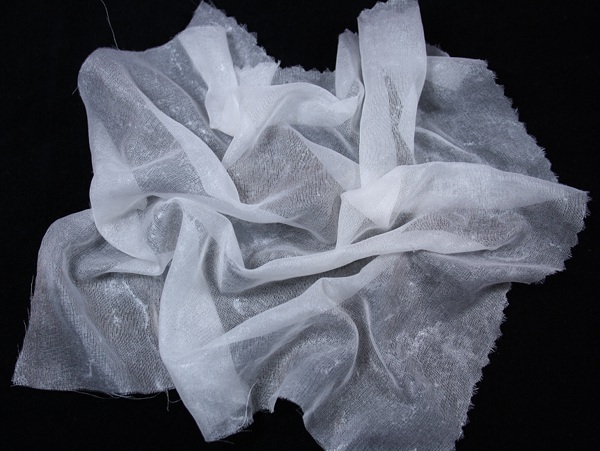 I have a tendency to fibre-snobbery, and I am very definitely not a fan of things obviously plastic in my textiles, so the idea of putting a film of plastic over my fabrics was not appealing. However I’ve been proven wrong and pleasantly surprised in the past and decided that I needed to at least give it a try. 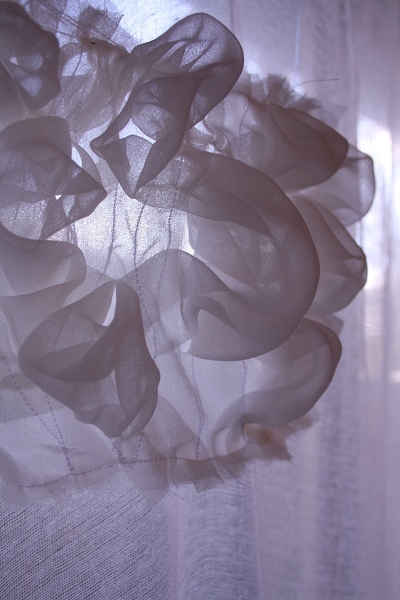 Above is the organza. The shape is pretty much as I formed it, so no problem there. But what’s the story with that shine? 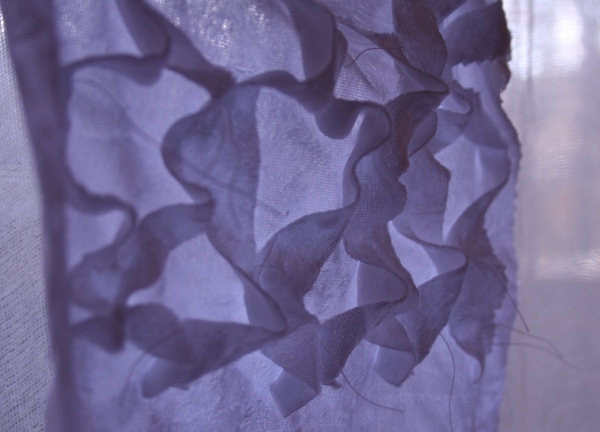 Above is the underside of the organza, shown in gruesome closeup. The major shine is the pooled film of pva where the organza touched the worktable (or at least the plastic cover on the worktable) as it dried. That seems to be a constant in almost all this set of samples, but its worse on the organza because you see it through the layers. There are also areas where – I don’t know a word so let’s call it the “pores” of the fabric – are clogged with pva. I diluted the glue with water about 50%, and I brushed it onto the fabric rather than dipping to keep the amount of glue down to a minimum, but it’s still more than the organza could absorb. 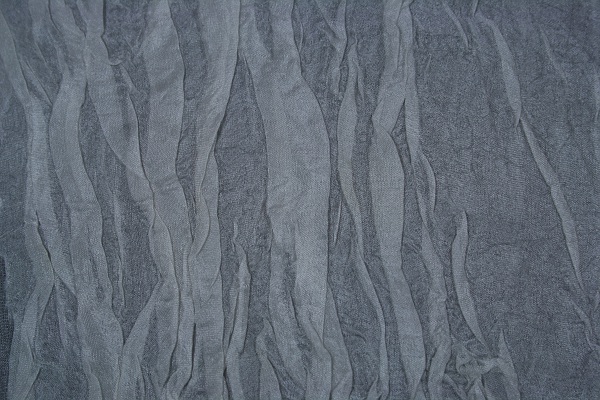 The paj silk above has some lovely flowing lines, but that’s not the deep glow of the fabric. The shine is the pva film underneath, and instead of being reflective the silk is translucent. There’s also an unpleasant stickiness to the touch. At first I thought this was because I made a mistake by using the glue I had to hand, labelled “tacky glue”. I assumed it was pva given it’s a white water-based product that dries clear. I’ve since checked the manufacturer’s website and it is pva. Possibly there’s an additive to make it tacky. Another form of pva might improve things, or maybe a more dilute application. 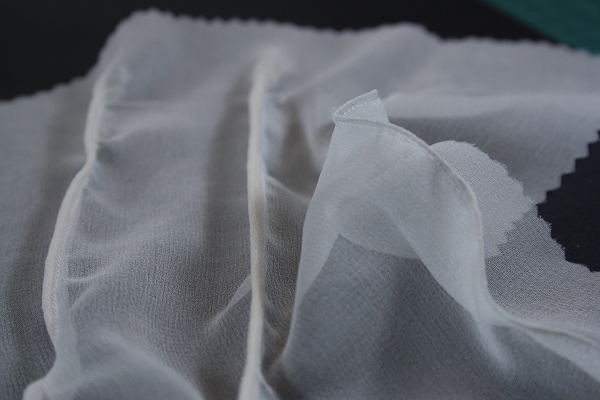 The slight stickiness could in fact be a positive, helping to keep a piece of fabric in place while you’re working on it, stitching or whatever. I’m having trouble seeing the point of taking a nice piece of silk and plasticising it. 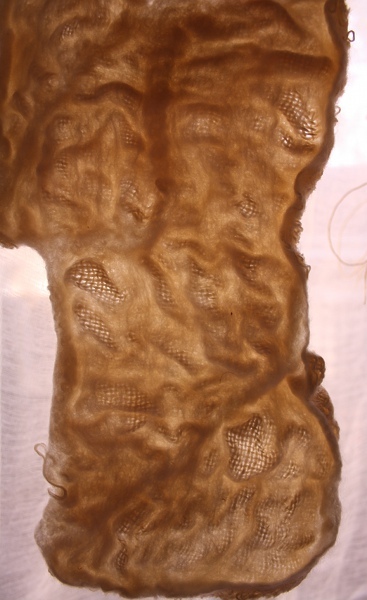 The tissue silk hides most of the downside of the pva fairly well. In real life there are a few little glints of shine where there shouldn’t be in the matt fabric, but not too much. 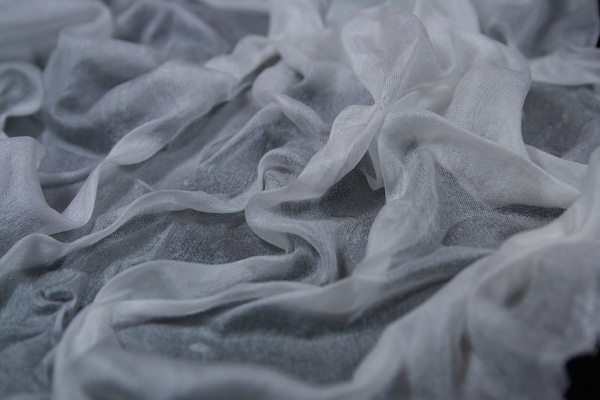 The texture of the silk is still attractive. It feels soft enough to handstitch into it. I can see (grudgingly) that this could be just what you need in certain applications. The cheesecloth is amazing. The fibres have somehow absorbed the glue, virtually no shine to be seen on the top or underneath, and it’s holding its shape well. It has more body than the untreated fabric. This is the first sample that has me thinking I’d like to try actually moulding over shapes using this. 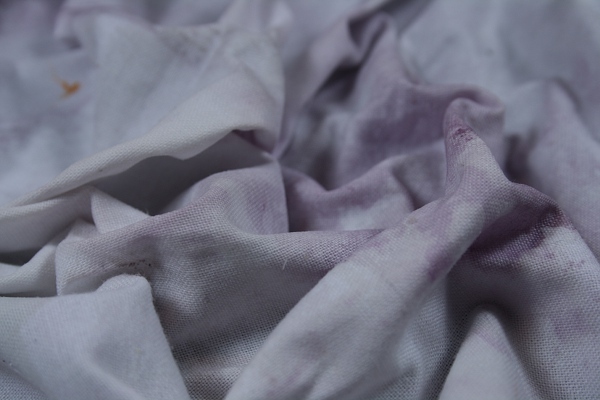 Unfortunately something contaminated my cotton sample and it has blotches of purple on it. Possibly there was some old dye on the plastic I used to cover my worktable. I can see this technique being useful to create height and shape on a piece, as long as the shiny back is hidden and you don’t have to touch it. I actually quite like the panne velvet sample. I was careful to paint the underside of fabric, so the pile generally isn’t too badly affected by pva. If anything the normal shine of the fabric has been reduced a bit, making it look a little less trashy. I don’t feel I can complain too much about the artificial feel on an artificial fabric. I created very deep furrows in the damp fabric and it’s holding well. The hessian also worked well. It’s even been able to retain a little of that nice hessian smell! There is some nice deep shaping. Hessian is generally very determined to do its own thing, but here it has been tamed. 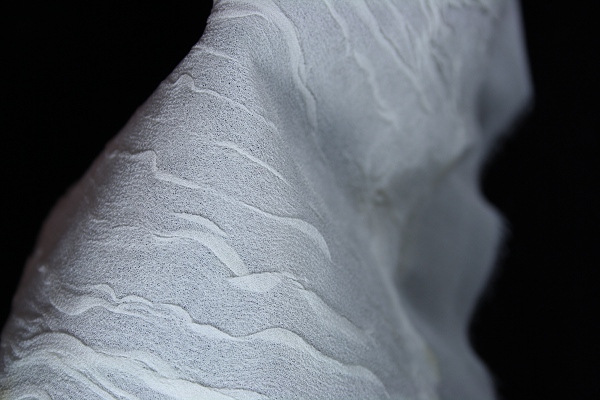 I can see this being used to create sculptural elements, or to add an area of deep texture or relief on a piece. 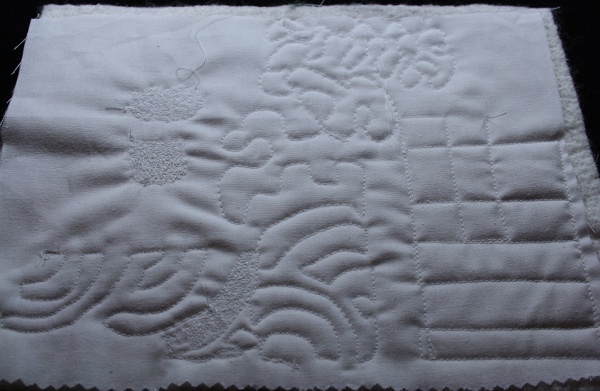 In the interests of maintaining my learning log I’m going to show my abortive attempts with quilting. It’s only a few brief assays, I didn’t go through my study set of fabrics. Basically the particular method I chose didn’t fit well in the overall approach I’ve been taking. I could have (should have?) revised my method. Instead I chose to move on to my final technique. Attempt 1 was on cotton. I went very traditional – a sandwich of two layers of the fabric with a bamboo quilt batting in between. There’s a simple grid using straight stitch, a couple of free-form variations, and some denser areas of stitching. Carefully angled lighting and photography means the unexciting results are at least visible. Thinking the batting didn’t have enough loft to complement the stitching, I tried again with some wool batting that was lurking in the cupboard. The result is a traditional approach badly done. 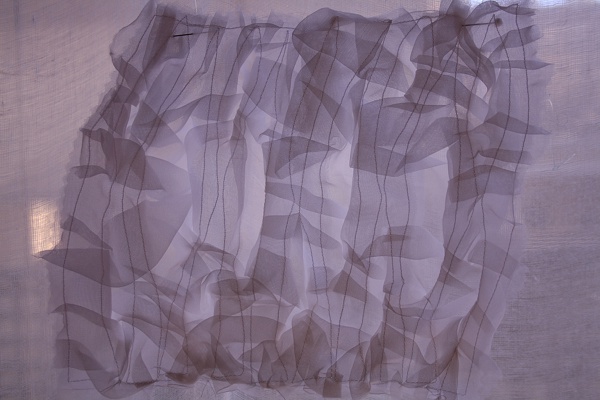 In attempt 3 I moved to an organza sandwich and tried comparing results with the two kinds of batting. The wool is on the left, the bamboo on the right. At the top I tried capturing some rayon threads under the top layer of organza. 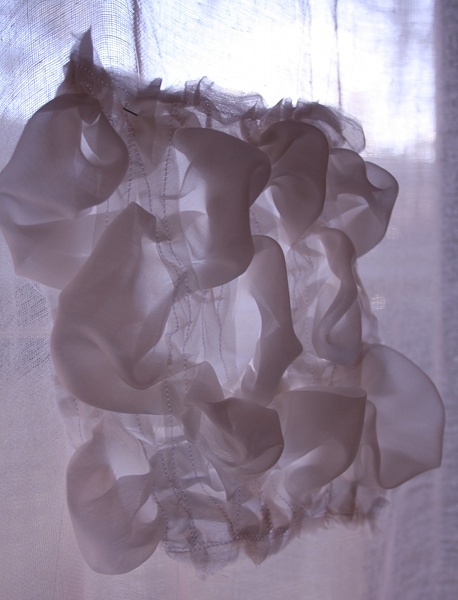 This approach does nothing to enhance or take advantage of the properties of the organza. It also doesn’t fit with my exploration of layering and manipulating light. I decided not to continue. 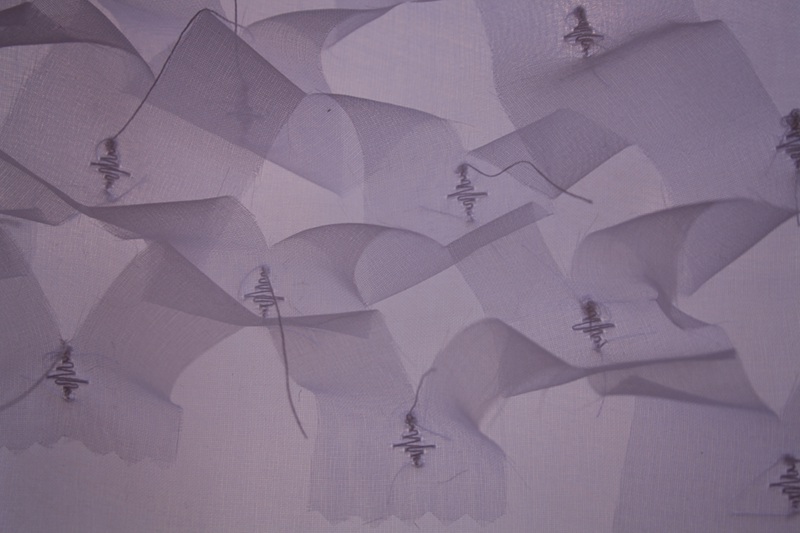 A better approach would have been to skip the traditional batting and experiment with different inclusions – various grists and densities of thread and yarn; cutout shapes in other fabrics; beads or other items trapped by stitch… All of those could be used to alter the passage of light. Sequins or better, little sisha mirrors, could be effective. Following gathering, pintucks, piping and slashing I turned to pleating. I’ll say upfront that the results are much less dramatic than earlier techniques. I wanted to continue with my study set of seven fabrics, and also chose a technique that captures organic pleat-like texture rather than formal measured pleating. It’s based on my memory of a technique in McGehee’s “Creating texture with textiles”, although I didn’t go back to the book to check details. This photo was taken partway through the process. 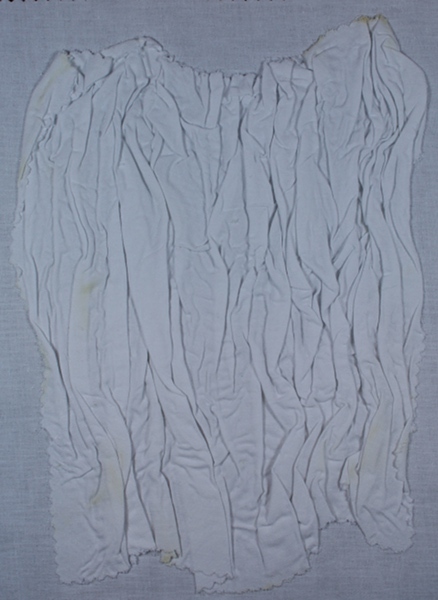 Each fabric sample was thoroughly wetted, then squeezed out and twisted tightly. 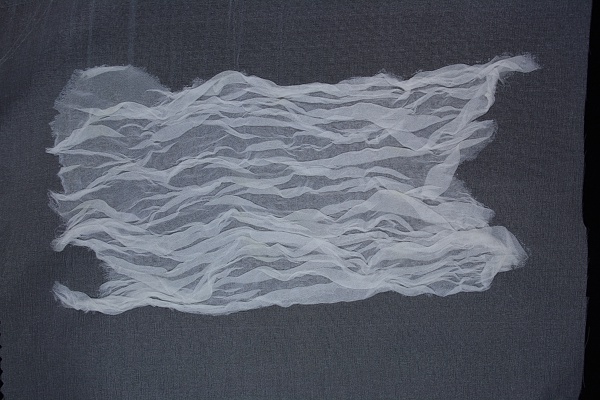 The twists were held in place using elastic bands while the fabrics dried – which turned out to be a mistake as a number of the samples show stains which I think came from the contact with (old) elastic. Some days later when they had dried, I opened out each piece of fabric, carefully keeping some of the pleats and folds in place. I recently got a steam press, which really sped up the steps of first flattening the fabric, then applying a bonding layer (misty fuse for most, and a heavier product for the heavier materials), and finally bonding the pleated material to a flat piece of the same fabric type. 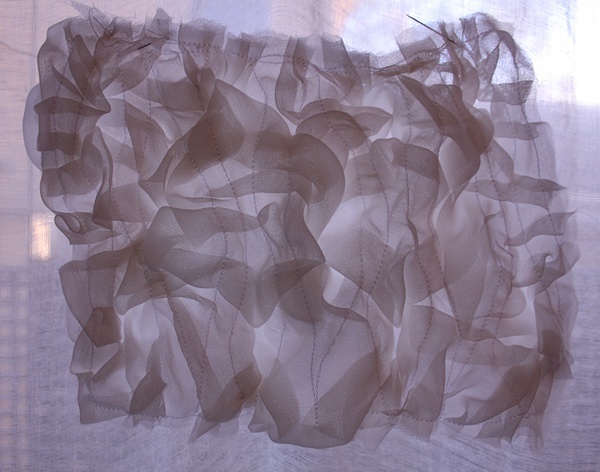 This is the organza, photographed on a matt black surface to help show up the effect of the pleating. 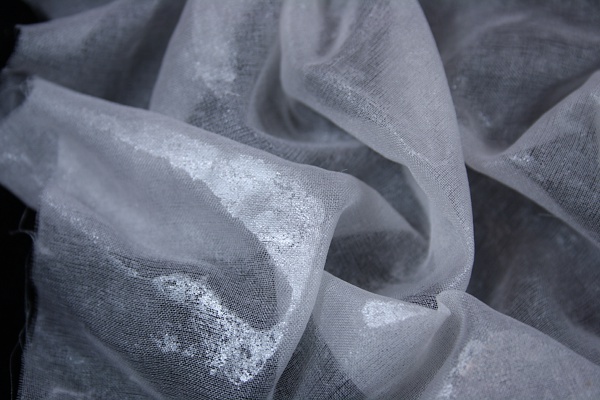 The organza gives a lovely crisp effect and the overall look is very textured even though the piece is in fact pretty much flat. As always, I like the way different numbers of layers of fabric causes varying opacity and colour. This particular example looks like a rough sea. It would be interesting to try a piece pre-dyed in a range of sea colours, possibly layered over other fabrics or items. 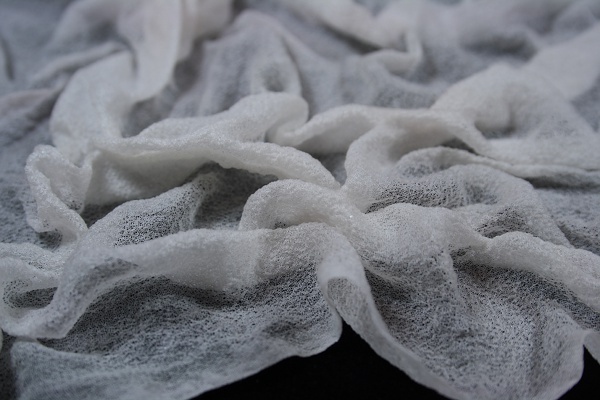 The tissue silk has a soft texture. It could work very well to suggest the mossy surface of a tree. In the photo above the sample is draped over the nozzle of a bottle of glue. I hope you can see that it drapes and folds softly, and certainly feels a very stitchable surface although I haven’t tested it. In the smaller photo you may be able to see some of the unfortunate staining I mentioned. 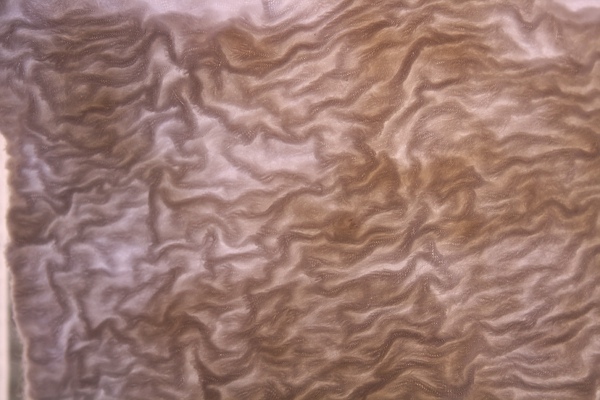 The paj silk maintains its customary sheen, although being basically flat I don’t see the amount of movement in light that has been in previous samples. On the plus side, it doesn’t have the same issues of crushing. 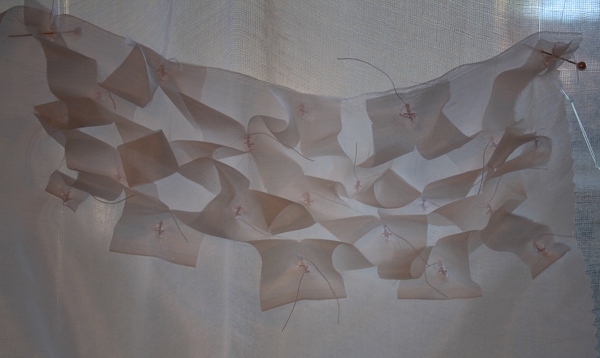 I wonder how well this light fabric would stand up to stitching. I think in the right colour it could really add to the surface interest in the work we did in Effie Mitrofanis’s class (blogged here, 27 July 2012). Perhaps I could experiment with one of the stitches that are mostly worked above the surface, like raised chain band, and try to put the base stitches in areas closely bonded to the supporting fabric. 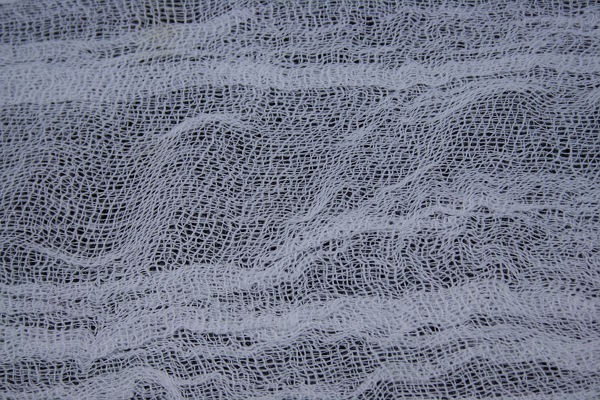 Cheesecloth. Look at those interacting grid lines of the cloth! In my first set of photos I actually had the sample upside-down, and didn’t realise until trying to follow the lines. 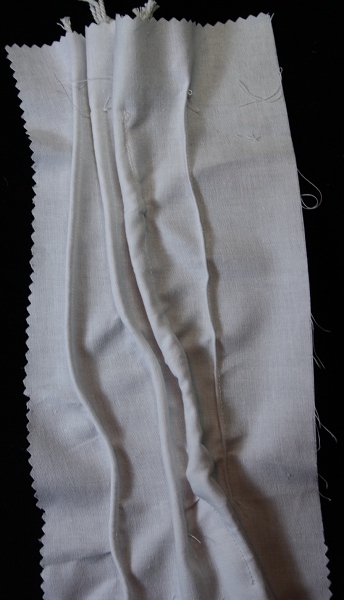 The sample is light and airy, but much more stable than the original cloth. It looks good layered over other things – concealing, revealing, distorting… It’s very light, so could be used to create texture or modify colour without weighing down a work. Perhaps it could create the impression of the haze of distance, giving depth to an image. 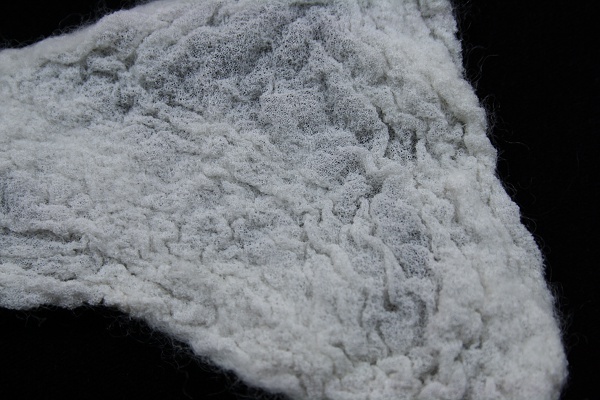 The cotton shows deep texture – but also unfortunately bad staining. After the other results it feels heavy and dull. Handstitching would be close to impossible, and machine stitching would be challenging. I think it would be easy to break a needle or get the foot caught in a pleat. Playing with the sample in my hands, it becomes more interesting when curved around so that some of the pleats stand away from the surface. I suppose if one wanted to create a very 3-D tree bark effect it would be worth trying. The final two samples, the panne velvet and hessian, are just plain dull. Dull, dull, dull. Possibly it’s the scale of the samples – it was difficult in such heavy materials to get pleating in that space. Also using the same fabric as the base doesn’t make much sense in these heavy materials. 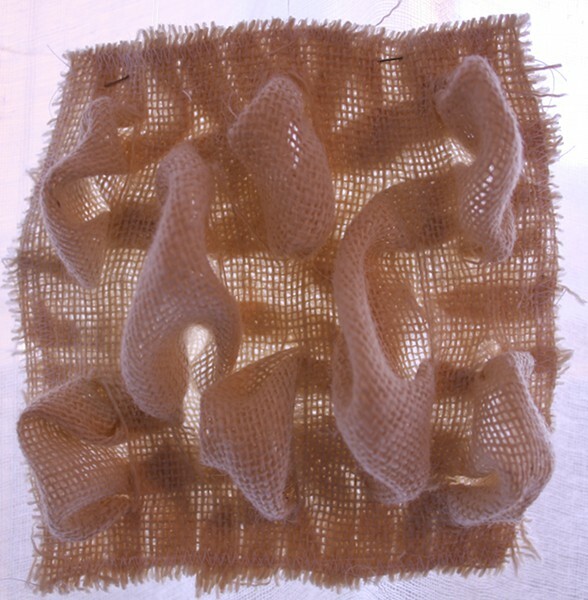 McGehee, L.F. (1998) Creating texture with textiles, Krause Publications. We’ve seen gathering, pintucks and piping. This time I explored slashing. For some reason I’ve always loved and been fascinated by lattice tops on pies. I don’t mean one woven with strips of pastry, but the ones which have a slashed sheet of pastry eased open. I decided to try the same thing with fabric, slashing and stretching one piece then sewing it down on another piece of the same material. 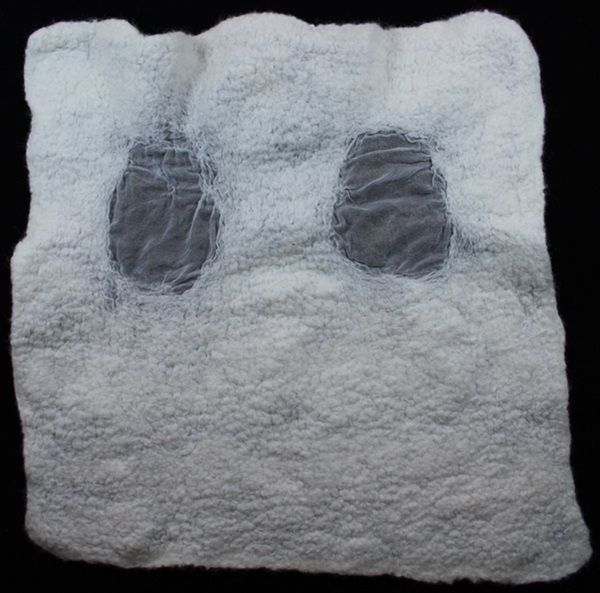 In my initial experiments this split into two versions – in the first version, the bottom (unslashed) piece of fabric would be as undistorted as I could manage in the process. 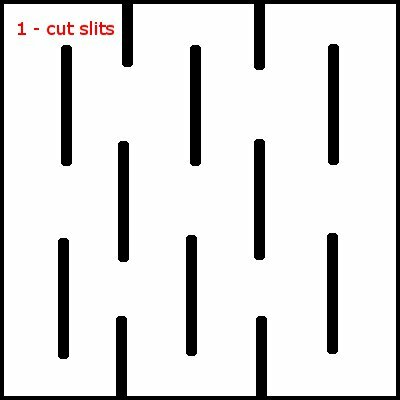 In the second version, the top (slashed) piece would be undistorted and the bottom piece would protrude through the slashes. Pictures (lots of pictures!) are coming, but first to explain the photo setup. In previous posts I’ve talked about the differing numbers of layers of cloth and the effect of lighting, but I often take photos of work at night (just the way timing works out – why “waste” daylight hours). Yesterday was a beautiful, clear, sunny winter’s day in Sydney and I decided to show more clearly just how wonderfully light interacts with the samples. This is the window of my workroom (formerly known as the dining room). 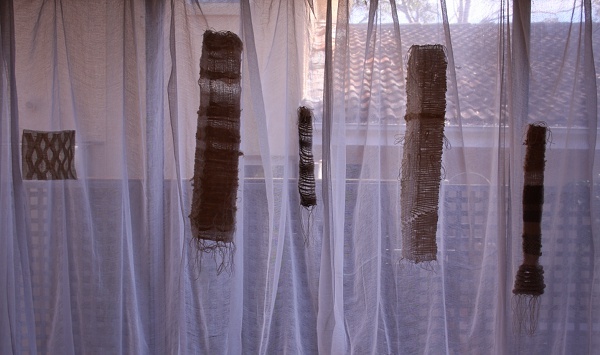 The “curtains” are unhemmed lengths of cheesecloth, a bit finer than the one in the current experiment set. The four hanging structures on the right are from the class with Liz Williamson in January (blogged 14 Jan ’12, here). If not the beginning, certainly that class is a major contributor to my fascination with light and the beauty and interest of contrasting textures in undyed fibres. 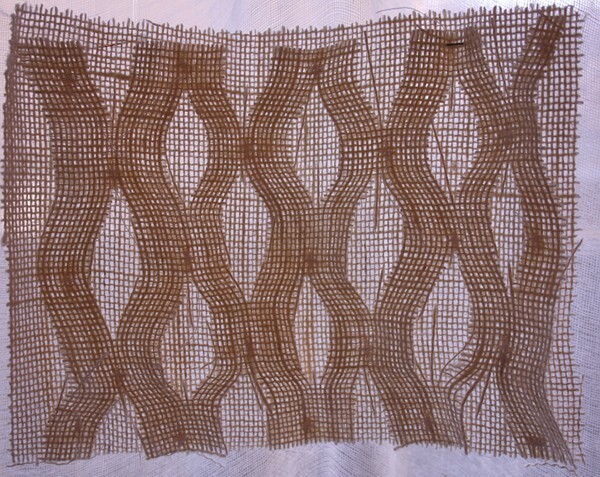 Actually three of those structures include strips of hessian as weft. 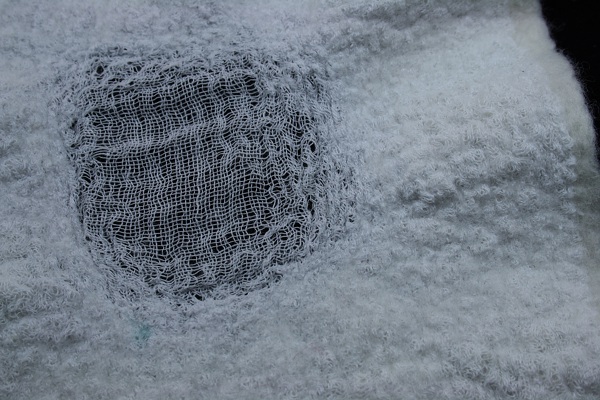 On the left of the photo, held up by an improvised system of fishing line and pins, is the first slashing sample (the very same hessian). Above is a closeup of the hessian. 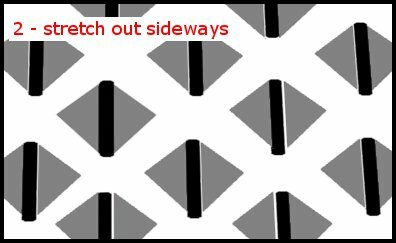 This was actually the last sample I worked on, but it is the clearest example of the stretched (distorting) top layer forming a lattice over the flat bottom layer. It’s hard to pick out in the big photo, so on the right is the same shot with the stitching points in red. I just anchored the fabrics together at the pivot points (the reason for that will be more obvious on other samples). Clearly my cutting and slashes were freehand and unmeasured, the stitching points uneven, edges are raw, threads hang where they will. The overall effect is one I like, but this is just one of many options. 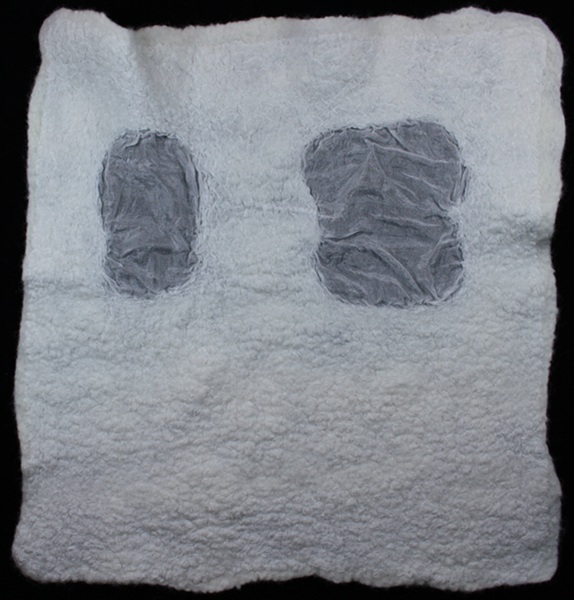 Above are front and side views of the second version, where the top fabric is fairly undistorted and the back fabric has been pushed through to form big puffs. On the right is a diagram showing the lines of stitching I did to stabilise the edges of each slash and the protruding fabric. A side effect I didn’t expect is that this arrangement is actually like a series of gussets, leading to more play and experimentation holding the sample in hand. The back fabric is around about triple the width and twice the height of the slashed fabric. Since the hessian is so bulky I did the gathering tucks around the edge before putting the fabrics together. For the other fabrics in the sample set I did some rough pinning then sewed the edges of the fabrics together, gathering in the backing fabric as I went. To complete the set, here’s a photo of the back. 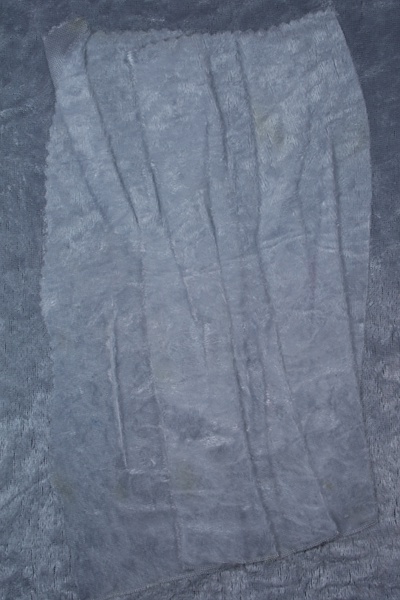 The deep folds of the back fabric block light, while the photo shows just hints of the deep pockets where the slashes are. In my eyes, both of the samples are beautiful. Both have lines with rhythm and variability. Version one offers complexity of colour (or at least value) and texture. Version two has a great relief effect which is quite stable. There is lovely play of light on the surface and through the piece. All the pockets and folds offer opportunities to stuff or fill or hide… something. The light transforms my plain, bland, white cotton. The hessian was the last sample I worked with. This cotton was the first. As you can see from the side view on the left, the slashed fabric on the top bulges out rather than sitting neatly on the surface of the background, and that’s the reason I only sewed the pivot points on this version of the study. If I tried to force a full, flat lattice on the top layer, the bottom layer couldn’t hold it without distorting. If the bottom was to be flat (a criterion I had set myself), the top had to bulge. Perhaps some of the bulges could be used to support … dangles (ie something unspecified). I probably wouldn’t want to use all – you’d lose the effect of the lattice and the height and things are pulled down by the weight (assuming anything but very light dangles). 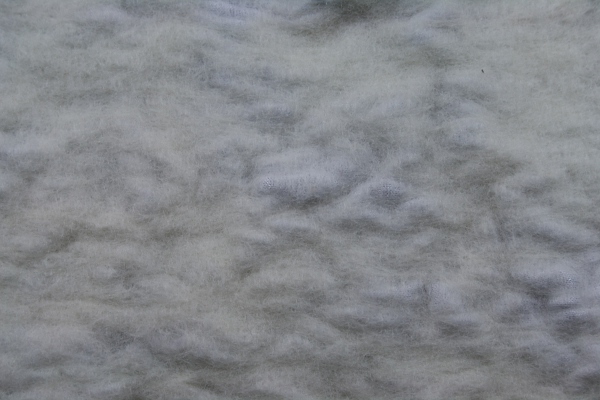 Version 2 of the cotton (top undistorted, bottom pushed through), in a straight front view. The lines of stitching are more visible, and the unevenness of my tucking/gathering both at the edges and through the slashes. My eye finds it difficult to interpret this photo. It looks mysterious and complex. I wonder if you could get a flower effect in the shadowing if you had just one slash and swirled the fabric underneath. Maybe it would look like a tornado – or from the bottom like a whirlpool. A material that didn’t work so well in this application was the paj silk. One of its major characteristics is that lovely shine, and that was totally lost in the back-lit photos. For the final one above I switched on the floor lamp for front lighting, which brought out at least a little of the fabric’s individuality. In a previous post I was very keen on the use of the paj to provide textural interest and contrast, but it’s not as straightforward as I thought. The particular application and expected lighting would need to be considered to bring out the best of the fabric(s). Version 2 of the paj sample also had problems. I found the fabric extremely difficult to control. Pins just fell out, everything slid around, and in the end fabric got caught in the wrong places at the back so the gussets/pockets aren’t formed correctly. An obvious response to this would have been more careful preparation, probably hand-tacking the fabric before sewing with the machine. I wasn’t in that mindset, I pushed on despite difficulties to see what would happen, and what happened was “a learning experience”. The big, floppy puffs of fabric still look good(more so when lit from the front), and the fabric is thin enough to show any contents quite well. 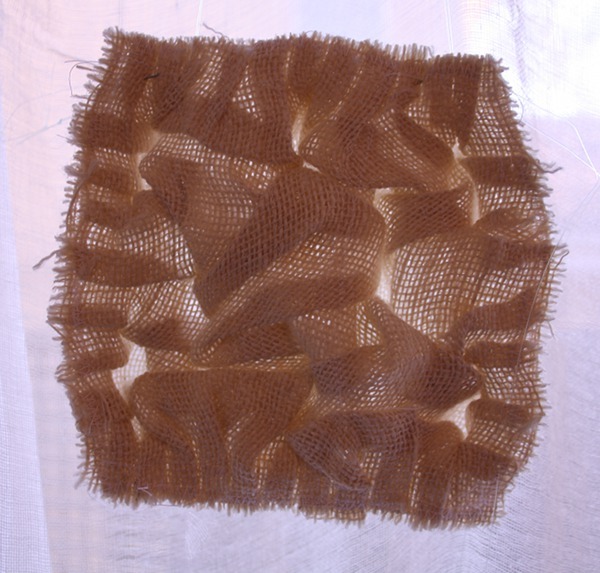 The cheesecloth is so soft, in version 1 it easily distorted to sit flat on the base fabric. 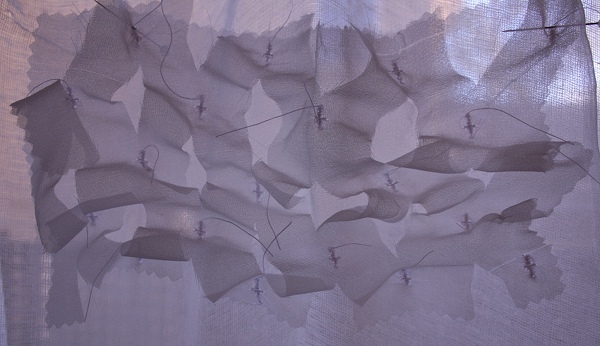 The sewing machine stitch pattern I was using produced little diamonds in most of the fabrics, but the cheesecloth just collapsed to form what look like bodies for the butterfly wings of the lattice. Very light, airy and unstable. I think some random areas of this would look rather good on my cheesecloth curtains. Version 2 in the cheesecloth is pretty spectacular too. The double layer and lines of stitching between the puffs give a little stability, and the open weave gives great visibility for any small treasures that might be stashed inside. I just tried it out with some brightly dyed silk cocoons. It’s night-time now so I can’t try the backlighting, but the gleaming colour and lovely shape of the cocoons showed clearly. 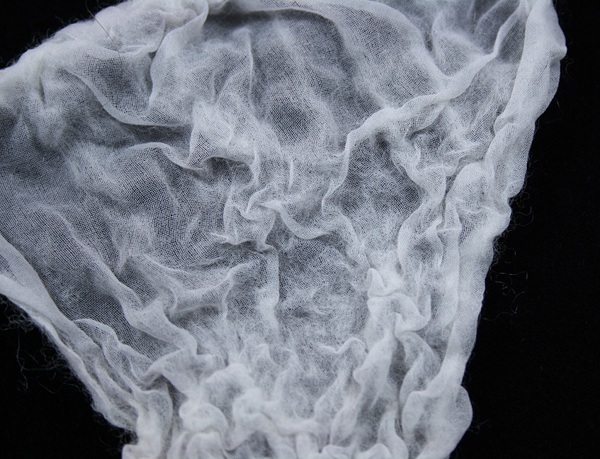 Above is a view from the back looking into a cheesecloth puff. I love the misty depths, although I have no idea at the moment of how it could be used. One positive is that it would probably post well, a major consideration in a distance course. It would flatten in transport, then just a little shake would refresh it. I wonder if it could work as a metaphor for an ageing mind, not so sharp any more, having trouble holding or grasping ideas and memories. I must put a photo and fabric snippet in my theme book. 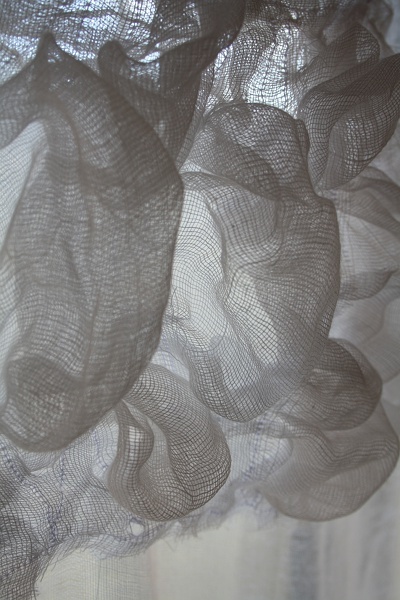 The organza has a crispness and energy which this photo doesn’t capture. What looks like gentle folds are really springing away from the background surface. 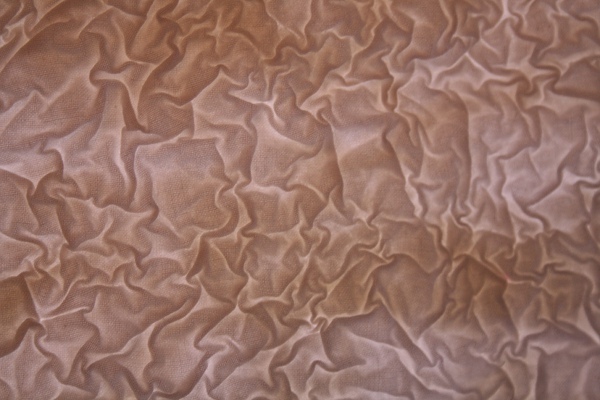 Similarly, in version 2 the puffs of fabric stand proud of the surface. Both versions retain that wonderful organza transparency. Even with all that volume of fabric, when I lay the samples over a printed page I can still get glimpses of the text underneath. In fact I find myself moving my head and viewpoint, trying to see through and focus on what is beneath. This aspect reminds me of a work I saw recently at the Biennale at the Museum of Contemporary Art – still to be blogged, but I’ll try to remember to refer back. The point is that it was interesting how parts of the work became visible or in focus when you looked directly at them, but out of focus or misted over from an angle. Intriguing. 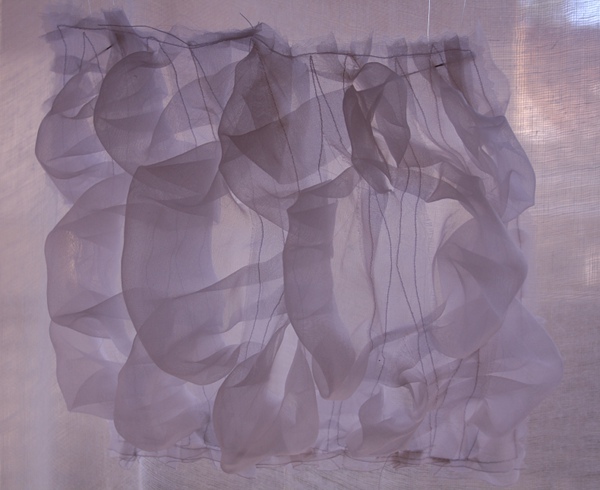 The back view of version 2 in organza has horizontal lines of shading where the fabric is folded, combined with finer verticals from the stitching and the voids of the slashes. The tucks of fabric seem to invite little inclusions slipped inside. 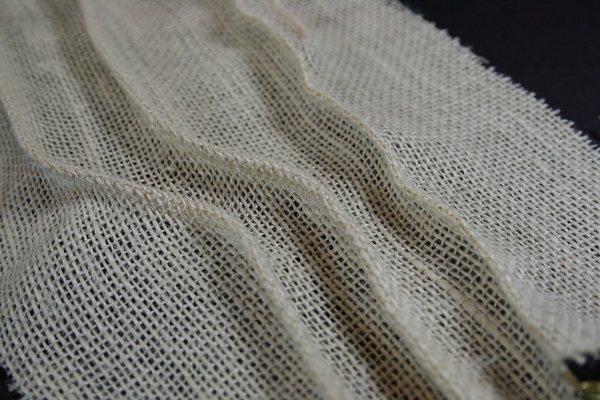 The lines of stitching across top and bottom limit the sideways stretch or opening of the sample. On a larger piece I think you could play with height versus width to create further variations. 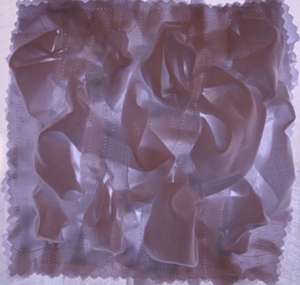 The tissue silk (version 1 above) looks very similar to the organza in these photos. 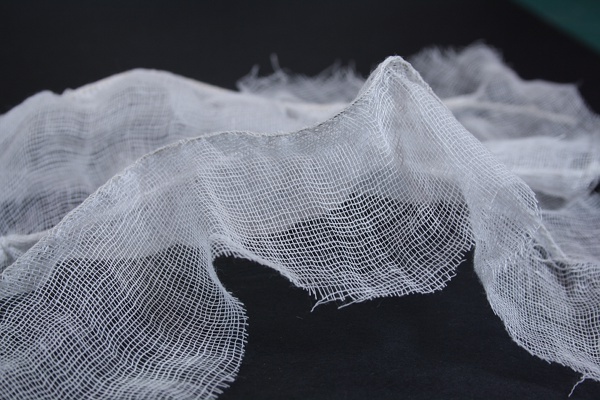 The difference is apparent in person, where the very soft gleam and the slight texture of the weave is apparent. It’s more delicate, more likely to crush. Version 2 front and back in tissue silk is above. 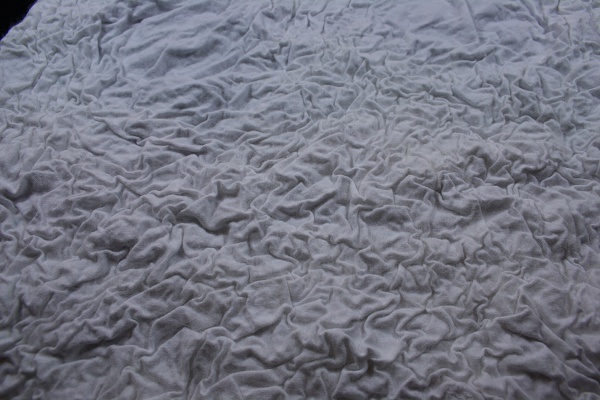 I wonder if the soft, crushable nature of the fabric could be used as an advantage – deliberately iron it all flat, lose all the dimensionality that has been created but keep the texture. It would be interesting to put mistyfuse on at least one layer before starting, then iron at the end to create a new integrated fabric. I’m in the middle of a process doing something vaguely similar exploring pleating, so I won’t follow up that idea just now. 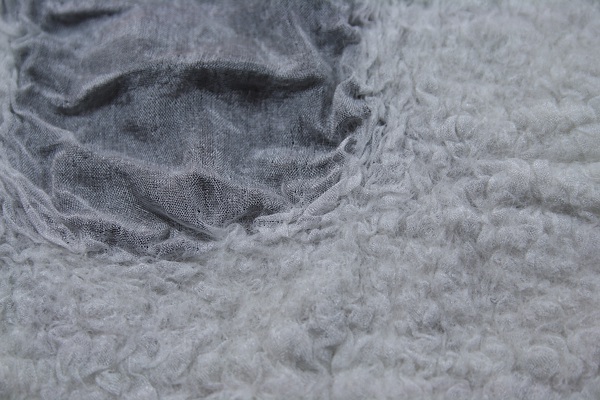 The final fabric is the panne velvet, and something very odd has happened in the photographs. The trashy shine is gone and an intriguing structure and fluid movement is revealed. This is the front of version 2 in panne velvet. 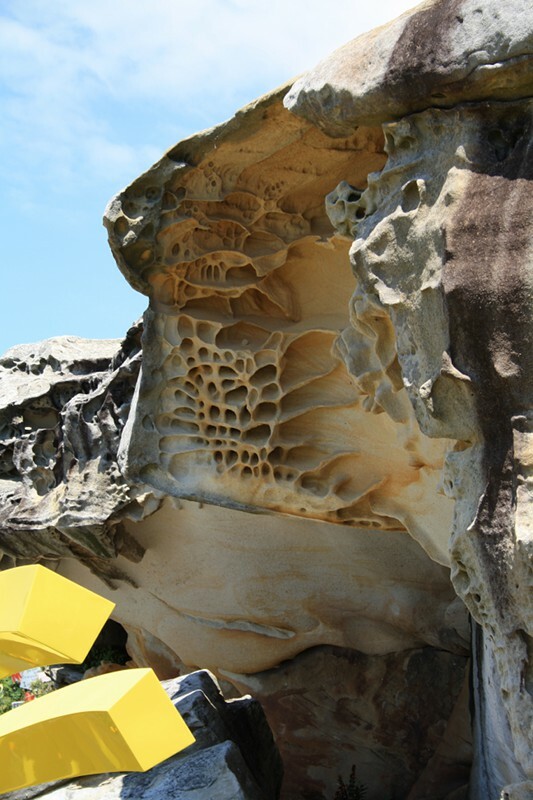 Lovely folds and cells – but look at the magic trick of lighting below. On the left, the lumpy mess of the back of panne velvet version 2. On the right – the amazing, intriguing back of panne velvet version 2. Wow. I don’t know how or when I’d be able to capture and use this effect, but it would be worth some effort. First was gathering, then pintucks. 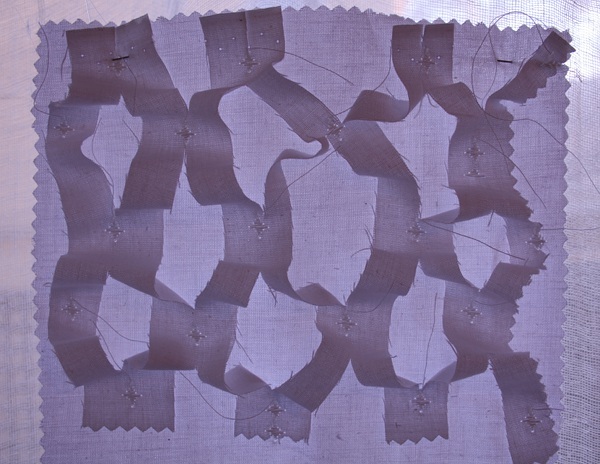 This time piping, experimenting with the same seven undyed fabrics and the sewing machine. As before I started with the white cotton, using the zip/piping foot on the machine and trying to go in a straight then curved line. Generally I think of piping in terms of an addition along a seam or edge, often in a different fabric or colour from the main body. 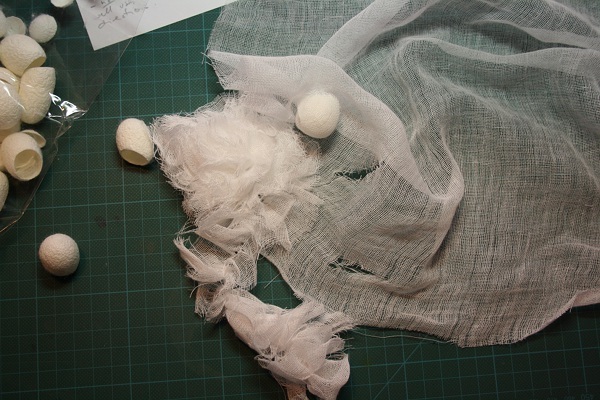 This time I was creating a tuck in a single piece of fabric and experimenting with different stuffings. From the left in the photo the first piping is over a fairly coarse string. This didn’t seem to create much of a bump or distortion, so in the second piping I used three lengths of the string. Next is the same tripled string, this time with knots of various sizes in it to form bumps. The final piping is 26 gauge artistic wire. I don’t particularly like the effect of the bumps. They were difficult to sew and just look lumpy and odd. 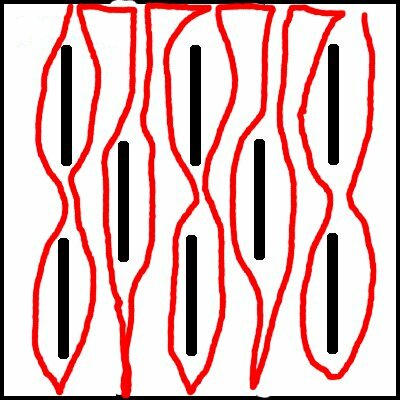 Perhaps the idea would be more effective with repetition, something like rows of hills in a range, or ripples in sand. The wire was also disappointing – a heavier gauge would be better at holding its shape in this weight of cloth. 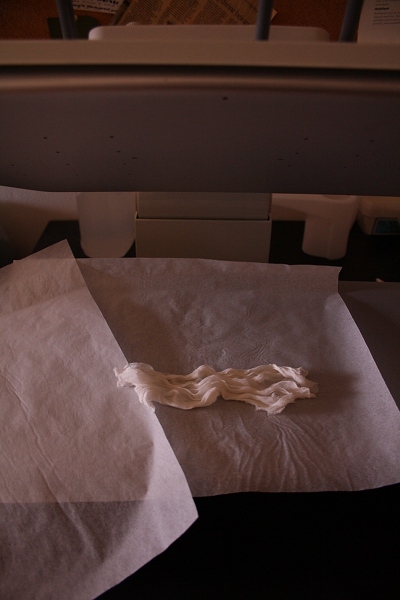 It was the second sample, tissue silk, where it started getting interesting. On the left is a smooth but fairly heavy cotton, then the same thread doubled, then the 26 gauge wire. This is where photos fail, because this sample just begs to be picked up and played with. I expected the wire to be effective in creating dimension and holding the soft fabric in place, and it does just that. 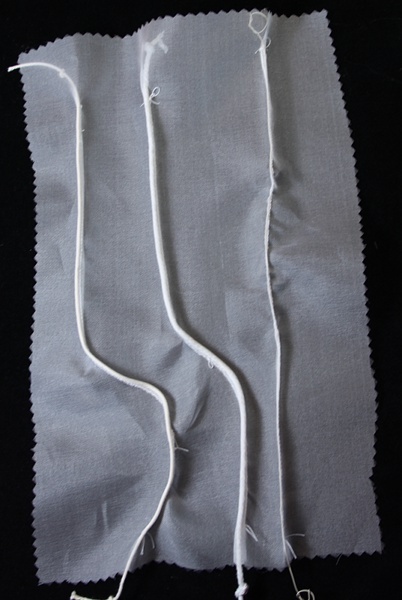 What I hadn’t realised is how easy it is to use the piping to form gathers – particularly easy when the filling is smooth – say a nice cotton, or some wire. I got the fabric fairly tight over the cotton (too tight in one spot where a stitch catches it), which means little gathers spaced along the length keep their place quite well. Obviously this wouldn’t hold with much handling. 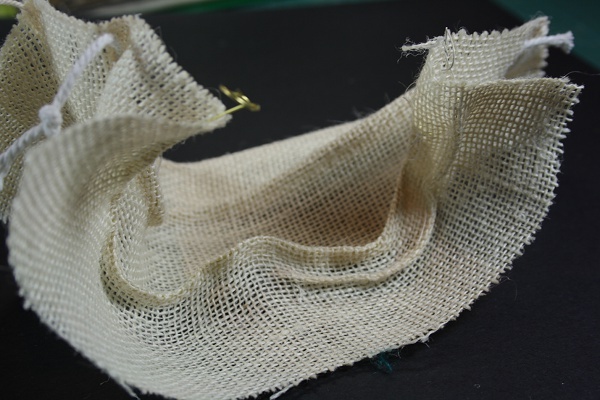 The fabric moves more easily on the wire, but a little judicious bending contains it to some extent. The one thing I don’t really like is the doubled cotton. It’s harder to manage while sewing and it looks a bit flat. On the cheescloth I used the smooth cotton yarn, the thicker and coarser string and the 26 gauge wire. Both the strings sit quite flat and give a nice strong line in the open cloth. The fabric gathers well and behaves nicely with the extra weight and stability. This could work very well in a hanging arrangement with light coming through. The wire is a bit of a star too, both strong and light enough to hold the fabric up without overwhelming it. In the photo above it looks to me like a line of surf, full of froth and foam. …There was just a pause while I looked at the lovely shadows that it creates, the lines of piping and the different densities of gathered cloth. 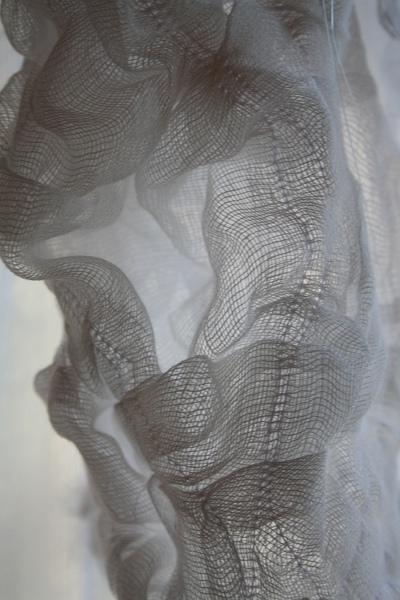 I’ve been thinking lately about the use of light in textiles – in weaving or applied later. Perhaps piping over light strips would provide opportunities – I don’t know what practical / technical / safety issues there would be. The paj silk is, as always, shiny and pretty and a bit difficult to handle. 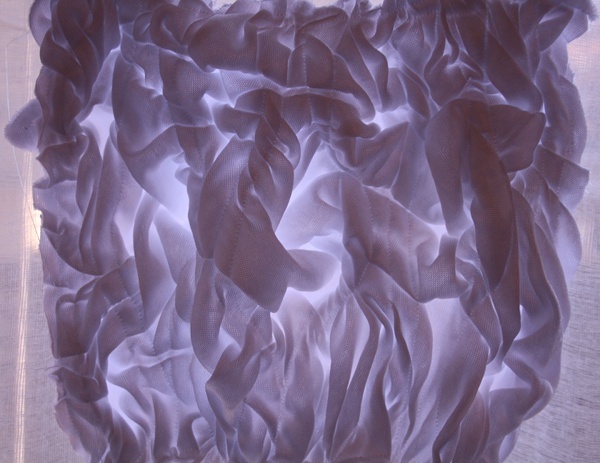 Returning to my hanging and lighting thoughts above, the paj silk has the advantage of being more reflective and therefore opaque. It would give some nice contrast and a change of texture in combination with some of the other fabrics. It is delicate and crushes, so wouldn’t be appropriate in many applications, but in the right circumstances it could be stunning. I wish I could like the panne velvet. I like the shine of the silk, so shouldn’t complain on that ground. Perhaps it’s a bit heavy and leaden-looking, especially in the rather harsh white. Perhaps it’s the volume of kid’s dress-up clothes I’ve sewn over the years. In any case, the wire holds it pretty well, although a slightly heavier gauge would be better. It gathers nicely. Working with it now, the two lines of piping interact interestingly depending on where I form gathers. You can get a lot of variety in a sort of cell structure, reminding me of some of the rock surfaces I saw while at Sculpture by the sea last year (blog post here) – although the shine doesn’t work for that. Finally the hessian. Beautiful strong lines. I like the crispness and solidity of the piping contrasting with the open weave. There’s some slight but rather nice distortion in the weave where the lines of piping curve (not really apparent in the photo). I started with the 26 gauge wire but couldn’t feel it as I was sewing so it didn’t get caught in the fold, plus it’s not really strong enough to resist the push of the cloth. I then went to 20 gauge. Lots of potential for 3D use.